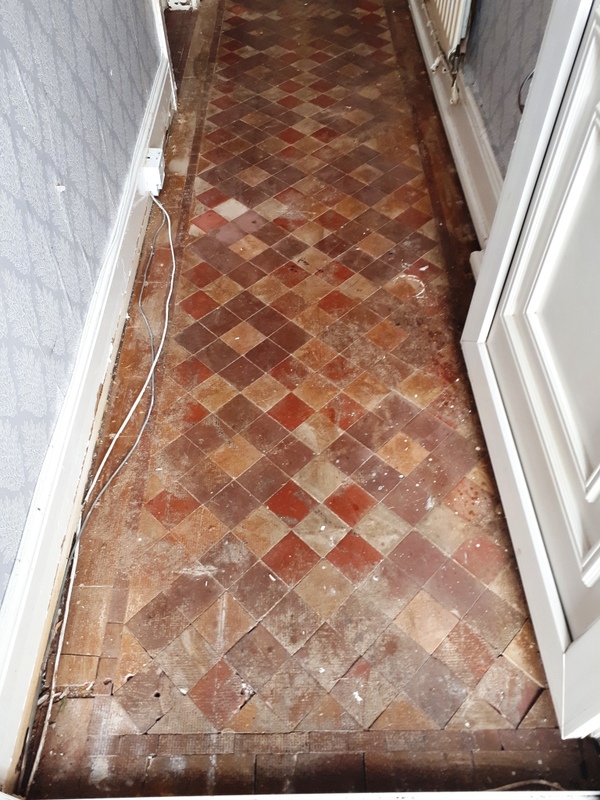 This customer from the Birmingham suburb of Erdington contacted me about an old tiled floor they had discovered in the hallway of their Victorian house whilst doing some renovation work. The tiles were in quite a state with ingrained dirt, adhesive, paint and some tiles were loose and cracked. The floor was so bad they were considering scrapping it and contacted Tile Doctor as a last resort just in case we could do something with it. 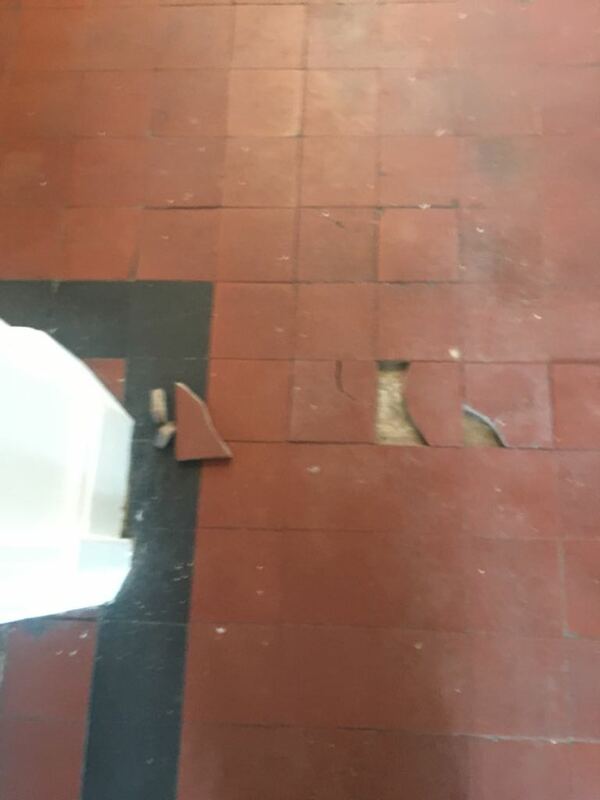 I went over to take a look and could see that as well as the problems reported to me over the phone that the tiles were also imprinted with what appeared to be the pattern of the underlay that must have covered the floor previously. Curiously there were some tiles by the front door which had what appeared to be holes drilled into them. There was also a porch area in front of the main entrance that needed renovating. However, I have in fact seen floors in worse state that this one and was confident I could restore it. I worked out a quote for doing the work which was accepted, and the job was booked in for a future date. My first task was to carefully scrape off as much of the paint and adhesive as possible using a sharp knife. 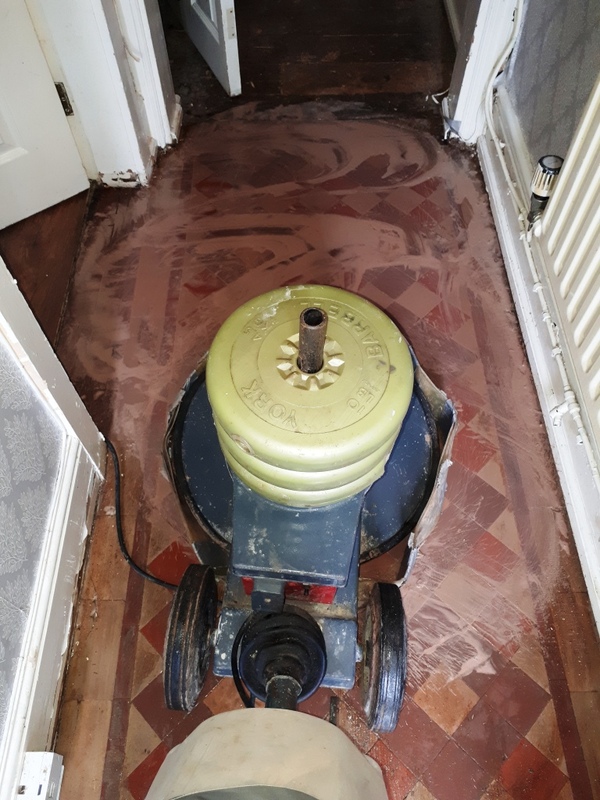 Then it was cleaned with a 200-grit diamond pad fitted to a weighted rotary machine, this gets into the pores of the tiles which hang on to the dirt and loosens the grime and dirt, it also helps to grind off the pattern left by the rubber underlay. The pads struggle to get into the edges of the floor so that was cleaned by hand with diamond blocks. Once I was happy the floor the soil was rinsed off with water and then extracted with a wet vacuum. Next, I gave the floor an acid rinse with Tile Doctor Grout Clean-up scrubbed in with a 200-grit diamond pad again. This helped remove more dirt as well as helping to neutralize salt and mineral issues that may be present in the floor. 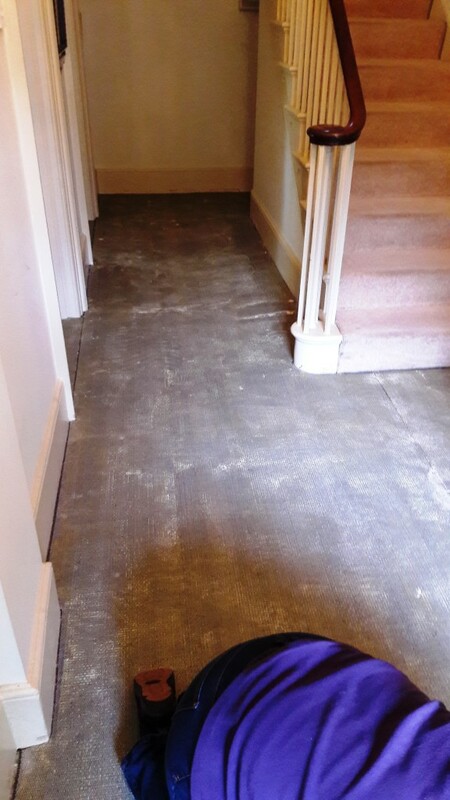 This can be a big problem with old floors due to the lack of a damp proof membrane. After rinsing and extracting again, I dried the floor off and went about resetting loose tiles and replacing some with replica tiles. These were grouted in along with other areas where the grout was loose and need of re-grouting. 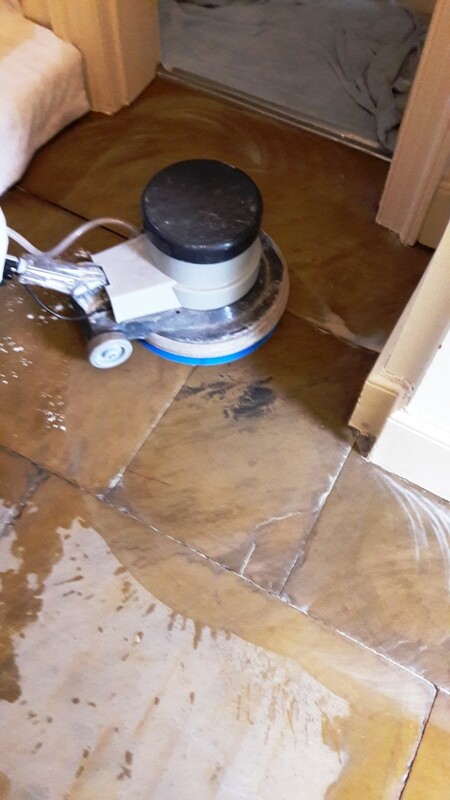 I left the floor to dry out thorough for a couple of day and then returned to seal the tiles first checking with a moisture meter that the floor was dry. We always ensure that floors are completely dry before sealing them as excess moisture can damage the performance of the sealer. 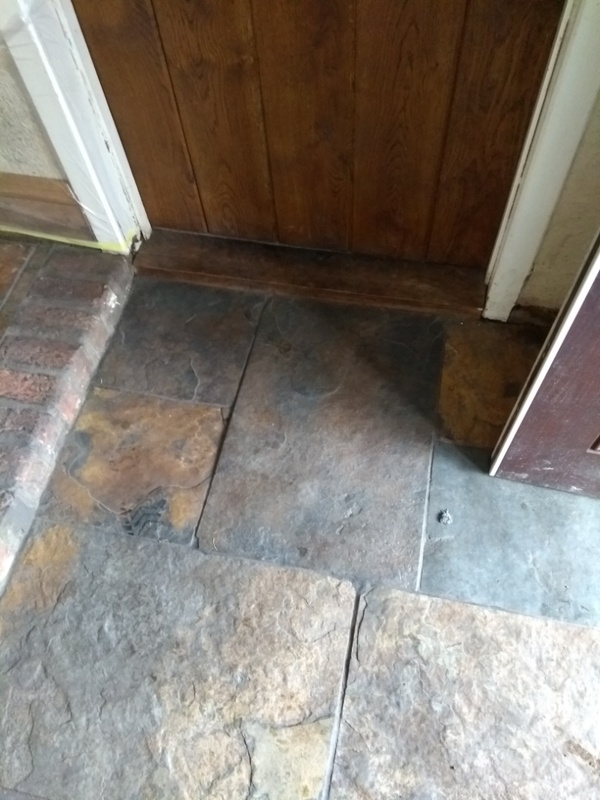 I found no evidence of dampness in the floor, so it was sealed with multiple coats of Tile Doctor Seal and Go which will add protection and works really well on old Victorian tiles where it adds a nice subtle sheen appearance. Also, being water based it doesn’t leave a smell as it dries. 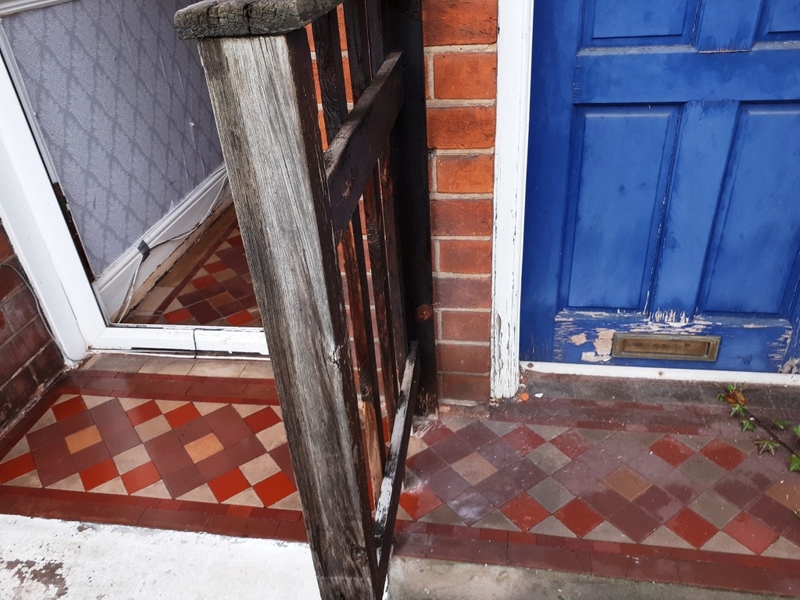 For the porch area which was partly open to the elements I used Tile Doctor Seal and Go Extra which is a fully breathable sealer that will cope well with the damp conditions. 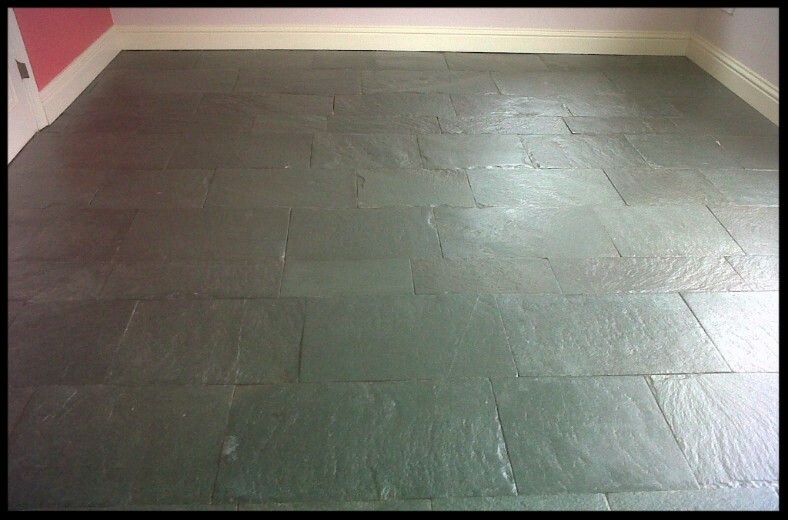 The floor was unrecognisable from before and the customer was very happy with the transformation. 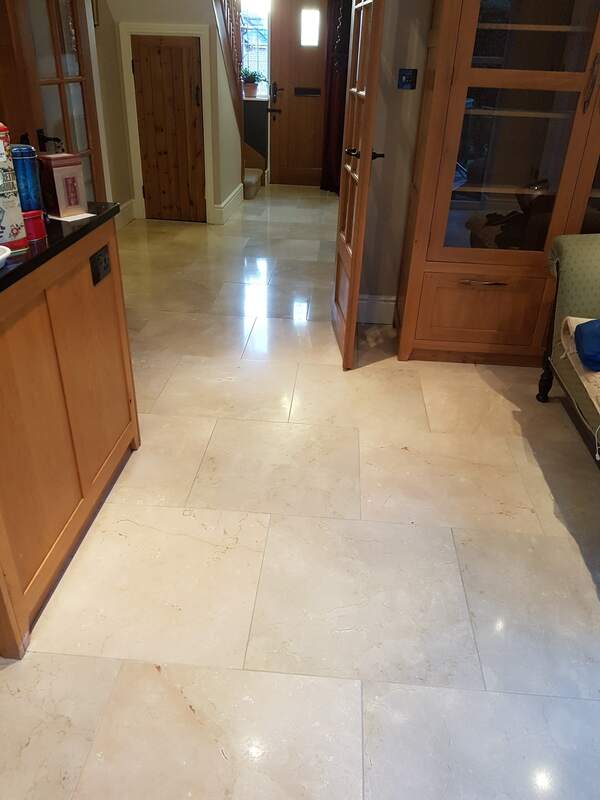 Before leaving I left the customer with a bottle of Neutral pH tile cleaner that they can use going forward to help maintain the tiles appearance. 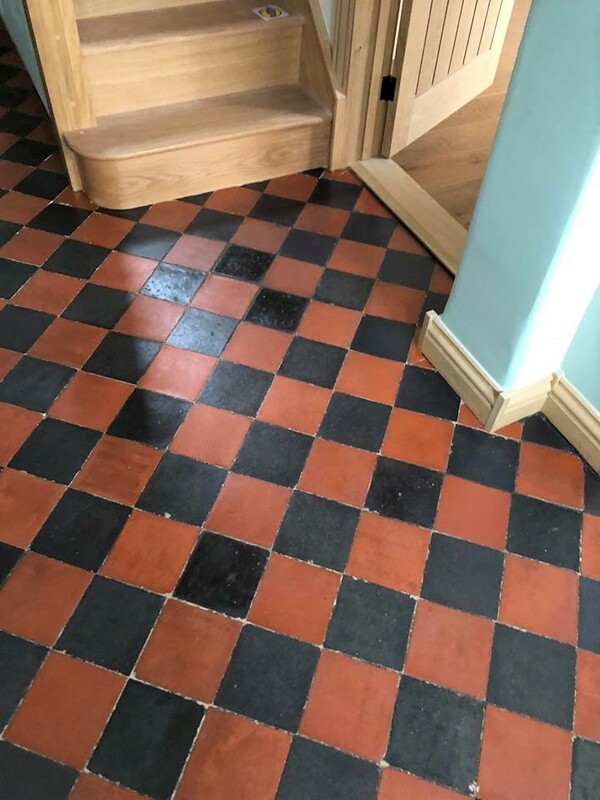 I was called out to a house in the Village of Great Paxton to quote for deep cleaning a sealing a Victorian tiled hallway floor, there was also a triangular cemented section at the bottom of the stairs that the owner wanted retiling to match. 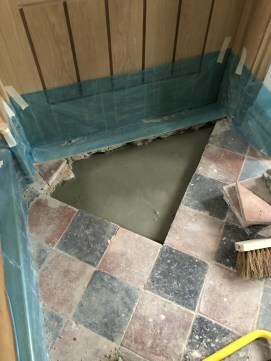 Fortunately, the owner had discovered some spare tiles in the under-stair cupboard that would do the job; were not sure why this triangular section had been cemented in at some point in the past, but I was happy that the spare tiles would be enough to cover. My quote was accepted, and it wasn’t long before I was able to return to carry out the renovation. I started by taping up the skirting boars and other woodwork with protective tape. Once that was done I removed the triangular section of cement at the foot of the stairs. I noticed that the sub floor consisted of rubble and sand so once removed I was able to lay a section of a damp prof membrane and then back filled with self-levelling compound. 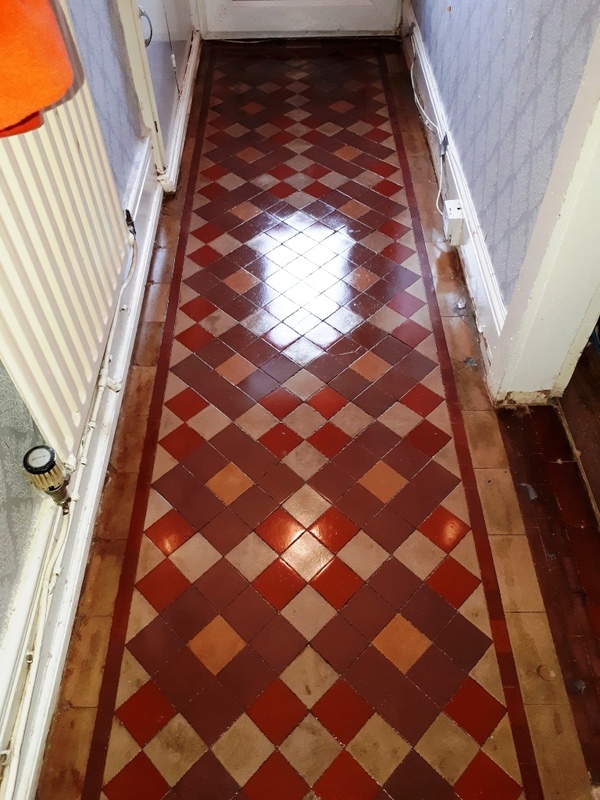 Once the levelling compound had dried I laid the tiles that the owner had found under the stairs continuing the black and red diamond pattern. I used a quick setting adhesive which enabled me to grout the tiles in before leaving for the day and leave it to set overnight. Day two was begun by inspecting the previous day’s work to make sure all was well with the tiling and then continuing the restoration of the floor. 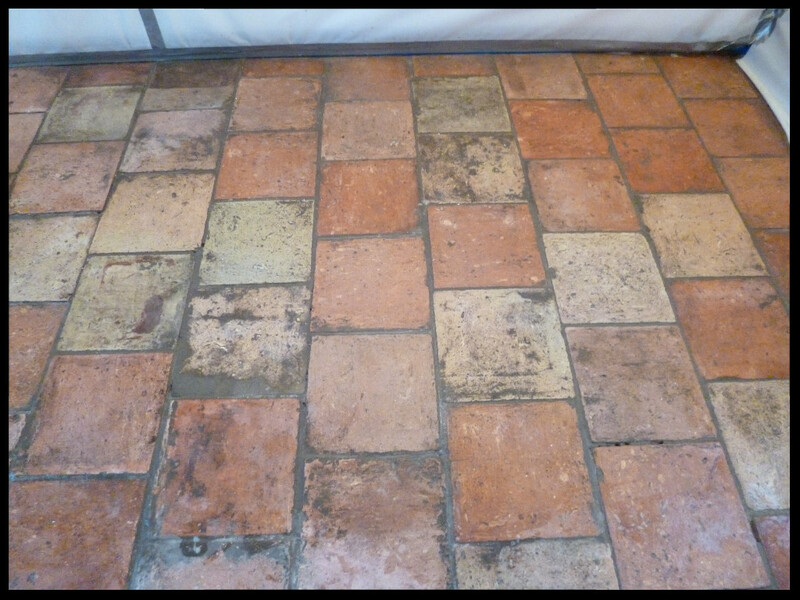 In general, the tiles were dirty and had white paint splashed from decorating and so were now looking dull and faded. 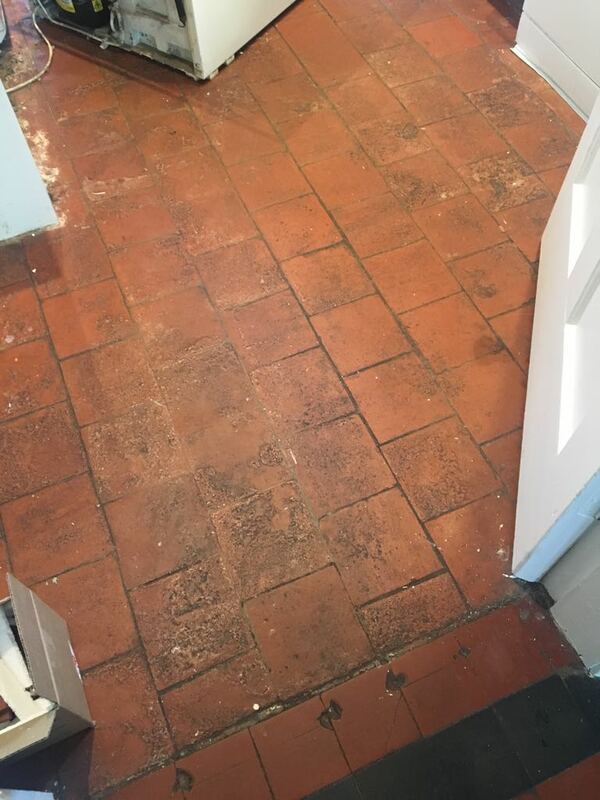 To remove the ingrained dirt, I gave the tiles a soak in a medium dilution of Tile Doctor Remove and Go which was scrubbed in using a black scrubbing pad fitted to a rotary floor buffer. This process did a good job of removing the dirt and softened the paint splashes which I was then able to carefully scrape off. After rinsing the floor with water and extracting the soil with a wet vacuum I could see the tiles were much cleaner but needed more work to get the replacement section to blend better with the existing. To resolve this, I honed the surface of the tiles with a 100-grit and then 200-grit pad rinsing with water and extracting after each pad. 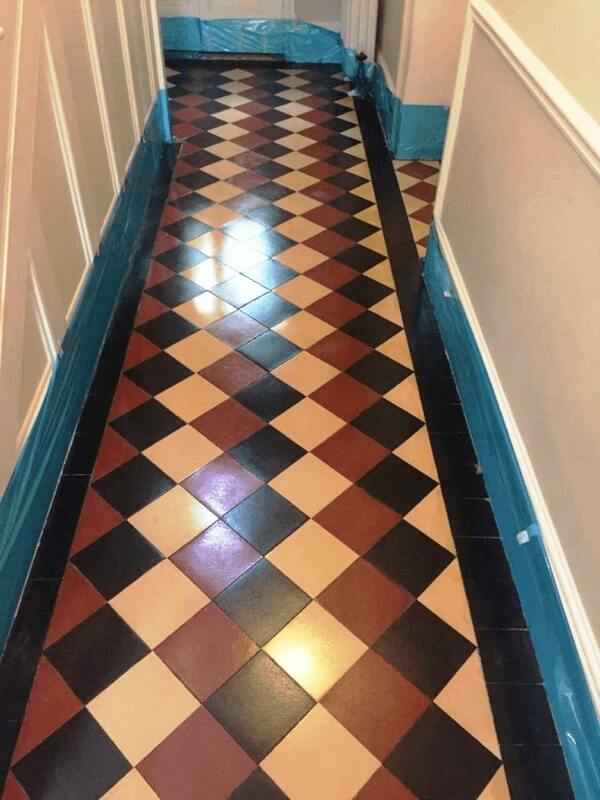 The floor was left to dry off fully overnight and I returned the next day to apply a sealer that would add colour and protect the tiles going forward. 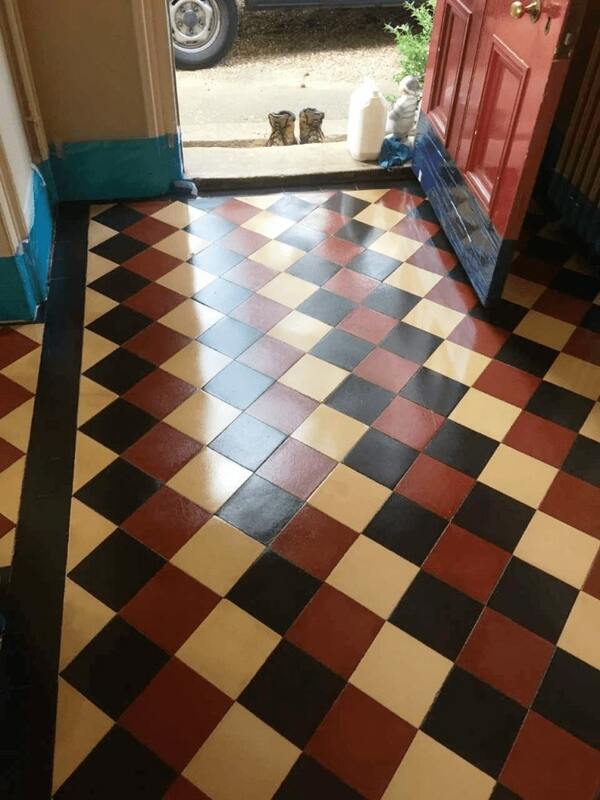 Multiple coats of Tile Doctor Seal and Go were applied which a water-based product that adds a nice subtle sheen to the floor which works well on Victorian Tiles and put new life into the tiles. My customer was very happy with the transformation and left the following feedback. 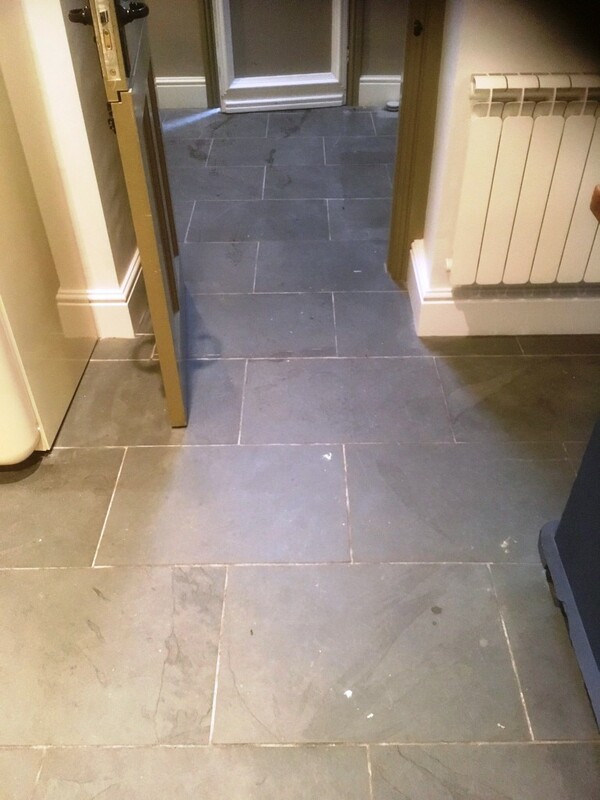 This client from Cirencester got in contact about his Slate Tiled hallway floor which was now looking dull following renovations to the property by the owner who was a builder. If you have never been I can recommend you pay Cirencester visit, it’s a lovely old market town that dates to the Roman times and is incidentally is the largest town in the Cotswold District. 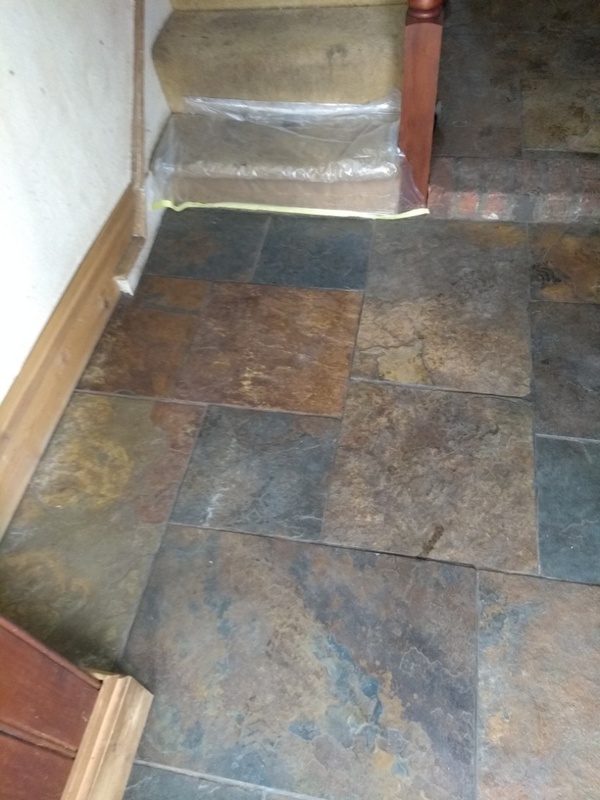 I arrived at the property and could see immediately that the floor had never been sealed properly and so the appearance had just got worse over the few years since it was laid. Dirt had become ingrained in the pores of the slate making it impossible to clean effectively. 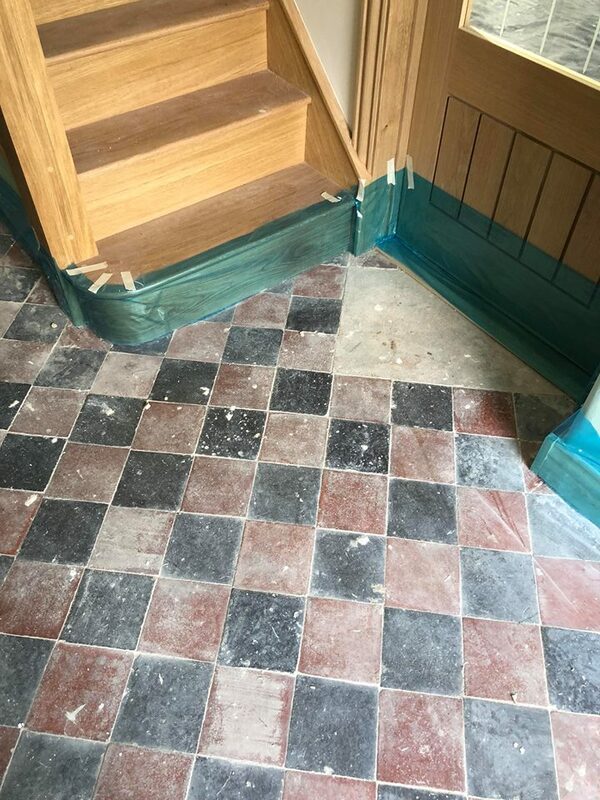 The client realised that the only way to fix the problem was to have the floor properly treated. We agreed a price for the work and popped a date in the diary to come back. As the floor was in the hallway, we needed to protect the stairs and skirting with plastic sheeting before we started. 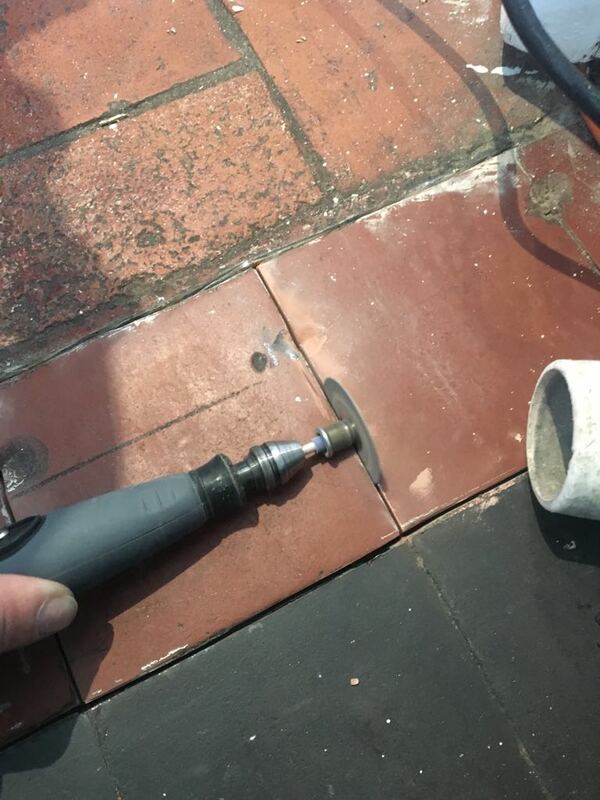 I then started cleaning the tiles with a strong concentration of Tile Doctor Remove and Go, this is a multi-purpose stripper which can remove most coatings and sealers and works best it left to dwell and soak into the stone for a long time before scrubbing it in. This also helps it work on ingrained stains and remove heavy grease build-up. 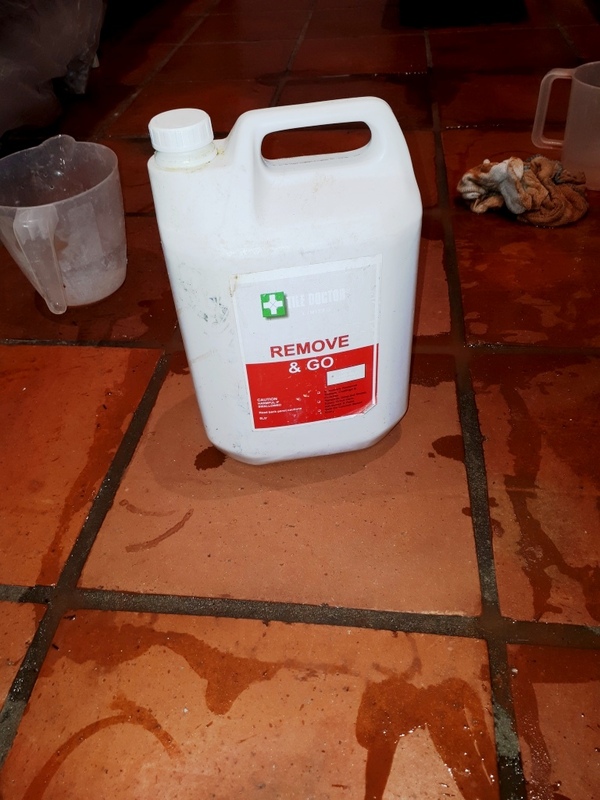 My primary reason for choosing Remove and Go was to remove what was left of the sealer so after applying it to the floor I left it to soak in for ten minutes before being scrubbed it into the tiles with a black pad scrubbing pad fitted to a rotary floor buffer. The dirt soon turned the cleaning solution black and the slurry was extracted using a wet vacuum. 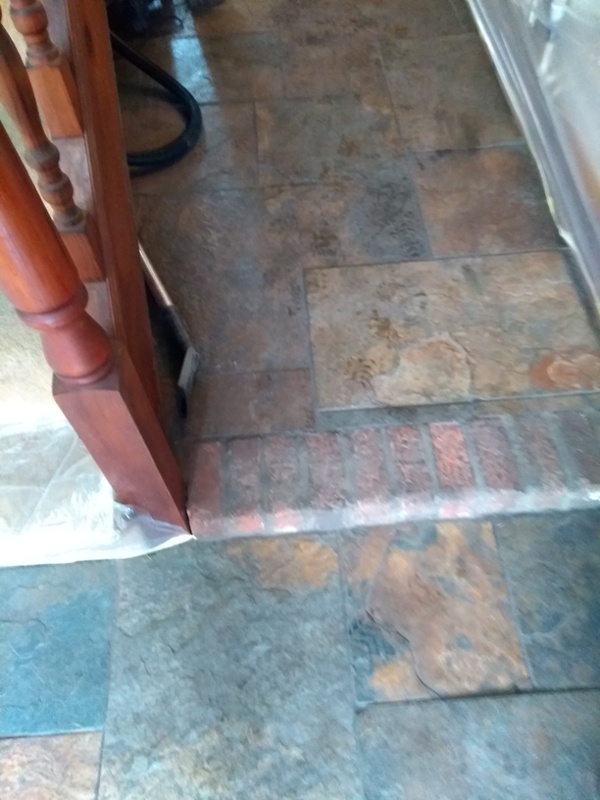 Next, I worked on cleaning up the grout using Tile Doctor Pro-Clean, this is good for neglected and heavily soiled areas and it makes short work of cleaning dirty grout. 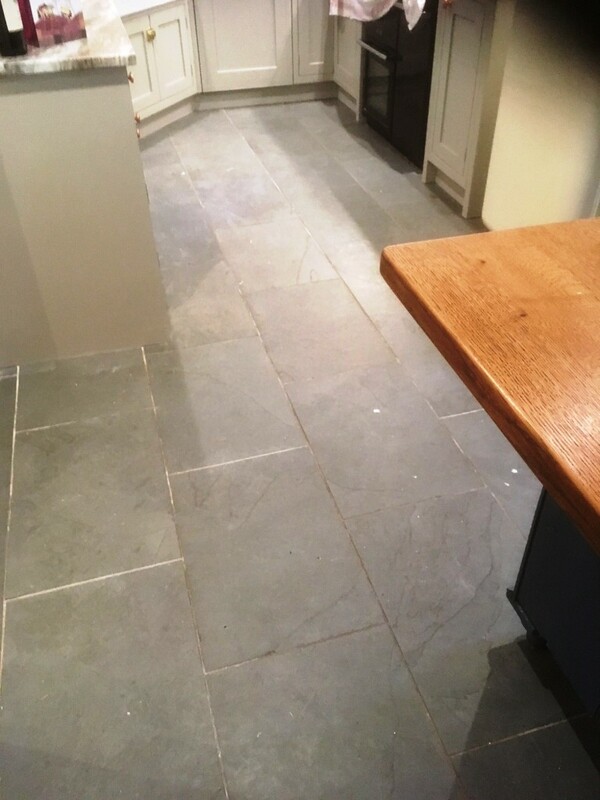 I had to scrub the grout by hand and once I was happy that the slate and grout was as clean as it could be the floor was given several rinses with water to remove the remaining dirt and remove any traces of cleaning products. Once this was done this completed the cleaning process, I was satisfied with our efforts and the floor was left to dry off overnight. The next day I checked the moisture level of the stone in several areas with a damp meter to check that the floor was dry. 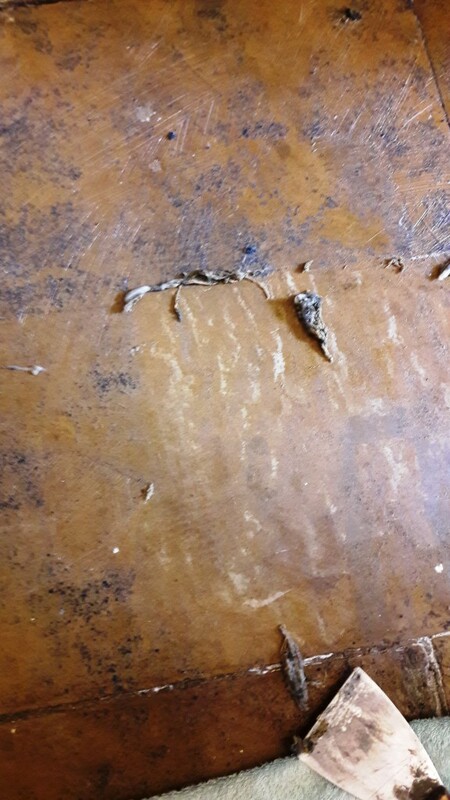 The sealer will not cure if the floor is not properly dried out. I chose a combination of sealers to achieve the look we were after. First, I sealed with one coat of Tile Doctor Colour Grow this is an impregnating sealer that occupies the pores in the stone thereby preventing dirt from becoming ingrained there. It’s also a colour enhancing sealer that works really well on Chinese slate to highlight all the colours. Once this was dry I followed with three coats of Tile Doctor Seal and Go which is water-based blend of acrylic polymers that provides both a stain resistant surface seal and a durable low-sheen finish, which was perfect for finishing this floor. The customers response was ‘It never looked as good as that’, and he now realised the importance of sealing the floor correctly! I love the natural patterns in this type of floor, it is one of my favourites. I was asked to clean the Limestone tiled floor of a very old house in the Village of Radcot which is close to the River Thames and dates to the 14th Century. Being close to a river is very scenic but can be problematic and I was told the house had experienced flooding in recent years. 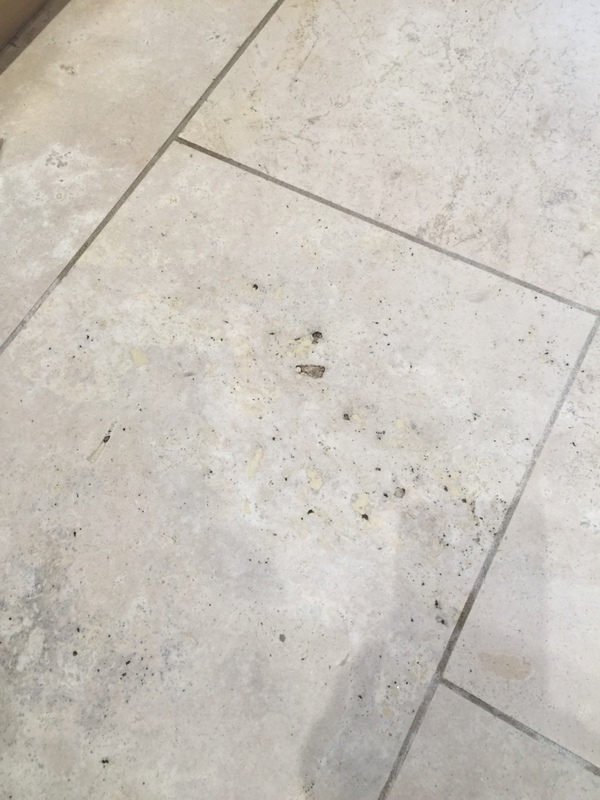 Whilst the Limestone floor clearly wasn’t as old as the house it was definitely in need of some attention to remove the dirty that had become ingrained into the pores of the stone and restore its appearance. 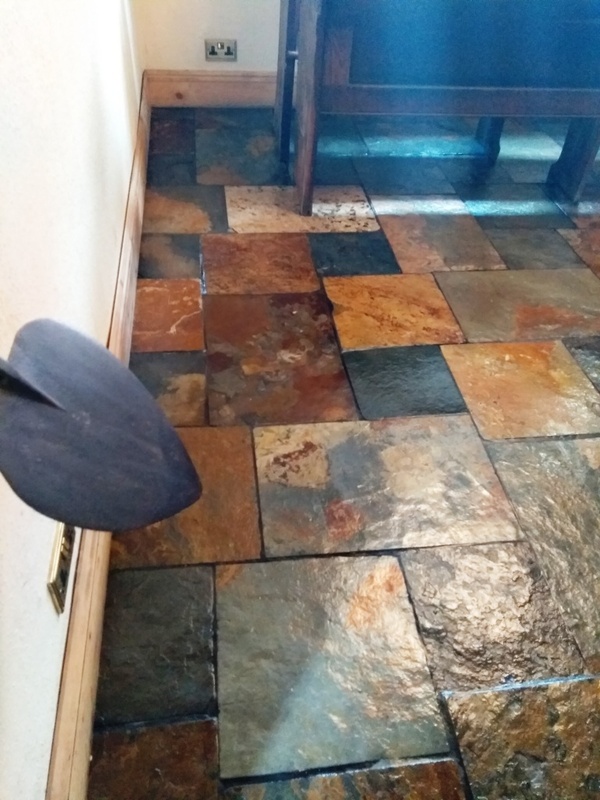 My first step was to let the floor soak for ten minutes in a strong dilution of Tile Doctor Pro-Clean, which is a strong Tile and Grout cleaner. The product was then scrubbed into the floor using a deck brush to remove any surface dirt. I also took the opportunity to clean up the grout before rinsing off the now soiled cleaning solution with water and extracting it with a wet vacuum. Next I turned my attention to the stone tiles which would need to be stripped back, re-honed and then sealed to protect them. I find the best way to achieve this on stone is through the application of a set of Diamond encrusted burnishing pads. I started the burnishing process by fitting a coarse 400 grit no.1 burnishing pad to a floor buffer and running at a slow speed, applied the pad over the whole floor. This coarse pad is designed to strip off old coatings and dirt from the tile. You use a little water to help lubricate and once complete it’s necessary to rinse the area with water to remove the soil that is generated. The next step is to start building back the polished surface with the 800 and then 1500 grit pads which are applied in the same manner. 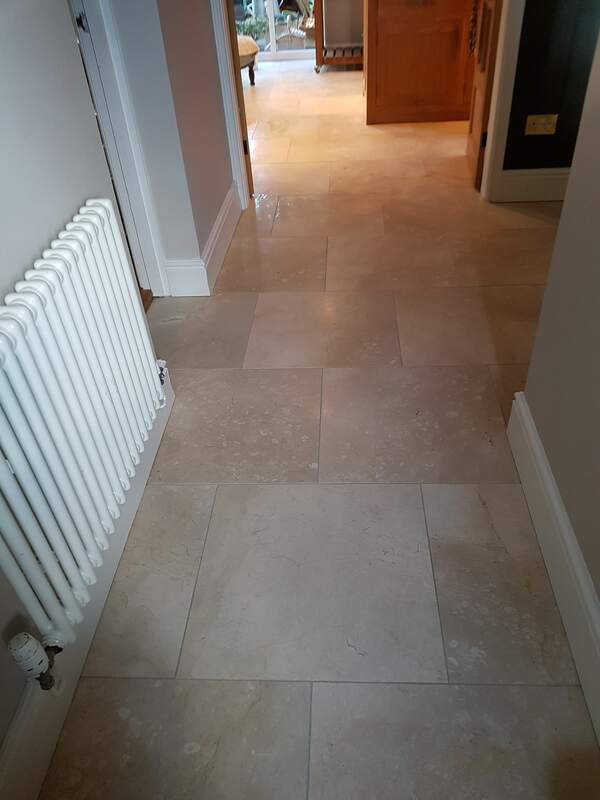 This floor was left to dry before moving onto the final stage of the polishing process which is to apply the very fine 3000 grit which further restores the appearance of the Limestone tile. This last pad is applied dry with a small amount of water sprayed onto the surface to help bring up the shine. With the floor dry I moved onto sealing the tiles in-order to protect them from dirt and staining. I used a couple of coats of Tile Doctor Colour Grow for this purpose as this particular sealer enhances the natural colours in the stone. It’s also an impregnating sealer that works by occupying the pores in the stone thus preventing dirt from becoming ingrained in the stone. My pictures of the floor are not brilliant but hopefully you can see how much more colourful the floor now looks. 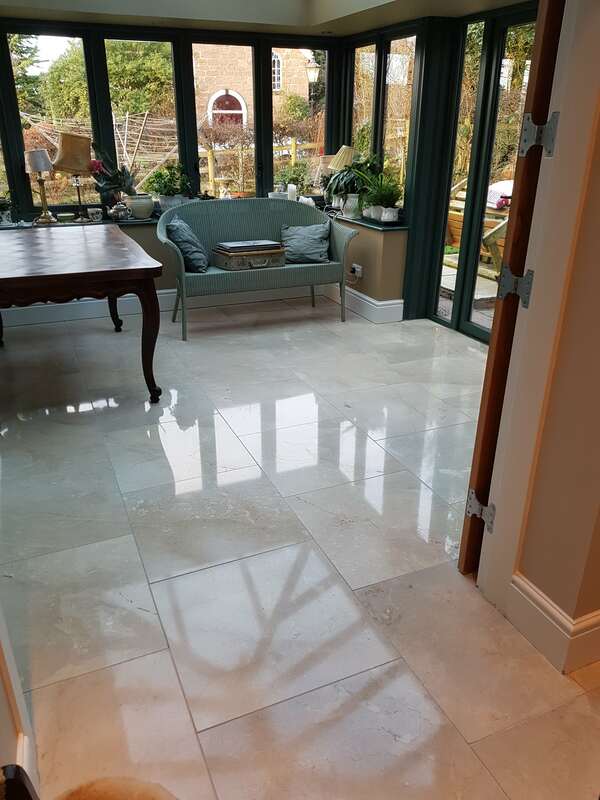 Weybridge is an affluent commuter town with good train connections into London Waterloo, as a result, there are some impressive houses here, many of which feature beautiful polished stone floors. 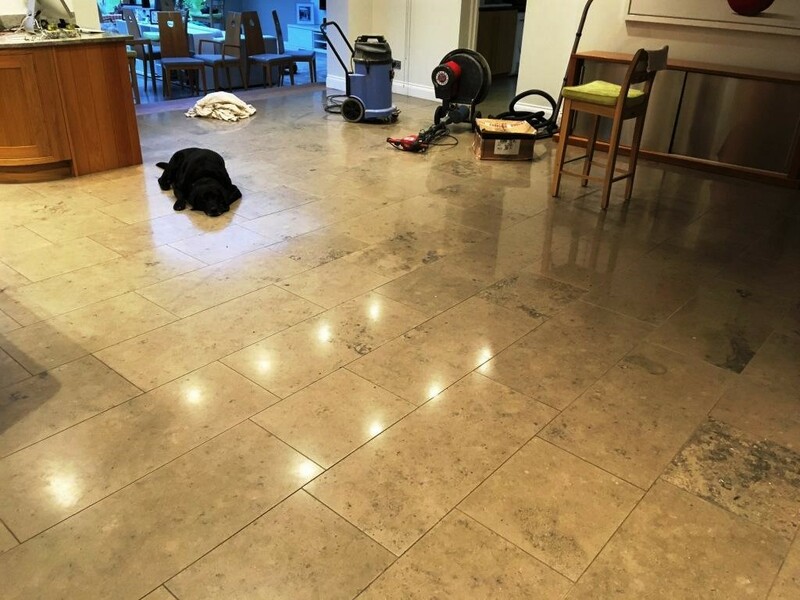 This particular residence in Weybridge had a very large Limestone tiled floor installed in their Kitchen/Dinning Room, the floor had been cleaned and sealed about a year prior, so it was still in good condition however the customers ageing dog had a few accidents which had damaged the sealer. 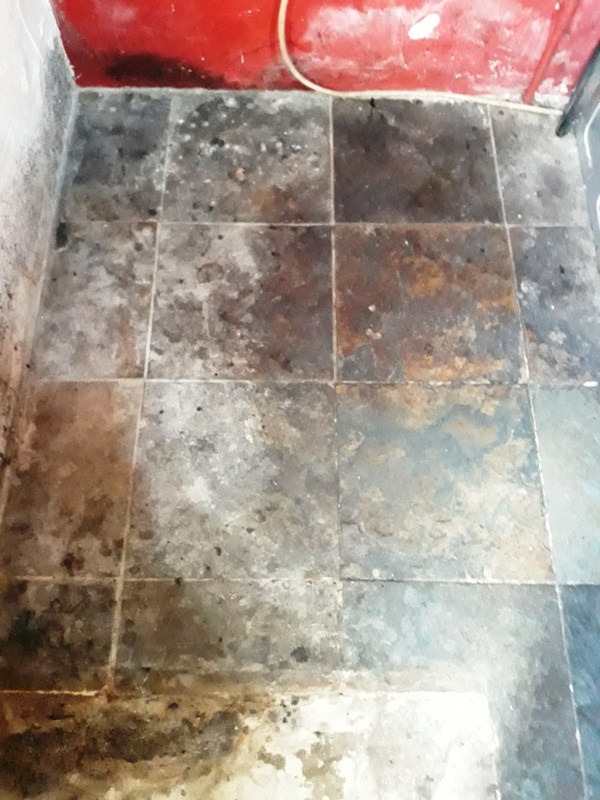 Urine contains Uric Acid which being an acid can damage the sealer, this is why for daily cleaning we always recommend using pH neutral cleaning product such as Tile Doctor Neutral Tile Cleaner or Stone Soap if the floor is polished. 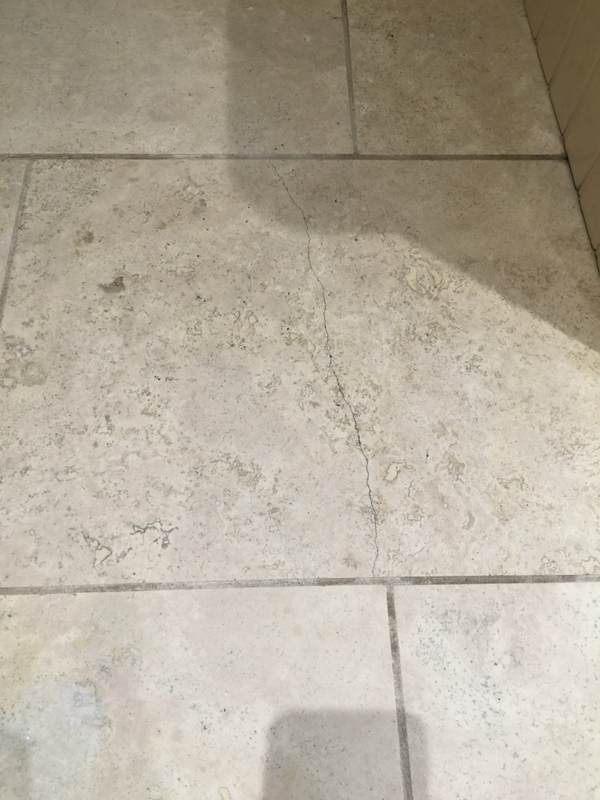 Limestone and Travertine are especially vulnerable to acids due to their high levels of calcium carbonate and often results in pock marks or small holes forming in the stone. Once we’d moved the furniture to another room I started with a deep grout clean. 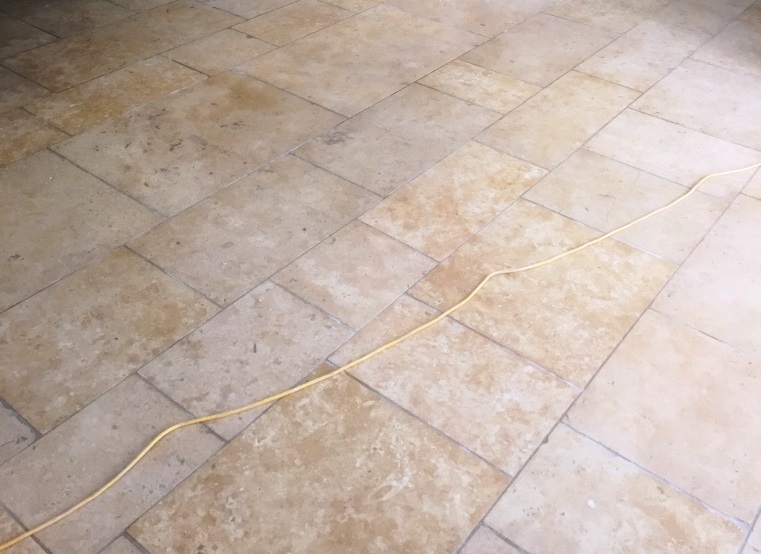 I ran a dilution of Tile Doctor Pro-Clean along the grout lines then left it to dwell for five minutes while I got the wet vacuum from the van. When ready I cleaned the grout by hand with a hard nylon brush and then extracted the soiled cleaning solution with the wet vacuum. With the grout now clean and the soil removed I set up my rotary floor cleaning machine ready to burnish the stone tile and restore the finish with a set of diamond encrusted burnishing pads. The first pad in the set to be applied is a coarse 400 grit pad that is designed to remove existing sealers and dirt and is run over the tiles with water for lubrication. During the following hours the process was repeated with the medium 800 grit and fine 1500 grit pads which gradually polish the stone and return the shine. The floor is rinsed between each pad to remove the soil which is generated from burnishing. This process took up much of the day so after rinsing the floor after the 1500 grit pad and extracting the soil with the wet vacuum I left the customer strict instructions not to spill anything on the unsealed floor. The tiles need to be dry before re-applying the sealer and any remaining moisture from the rinsing should evaporate overnight. Returning the next day, I tested the floor was dry the applied the first coat of Tile Doctor Ultra-Seal which is a natural look impregnating sealer that soaks into the pores of the stone protecting it from within. Once I’d wiped away any excess I left it to dry for half an hour before applying a second coat. Breaking for lunch allowed sufficient time for the sealer to dry and I was able to complete the floor with a final polish. 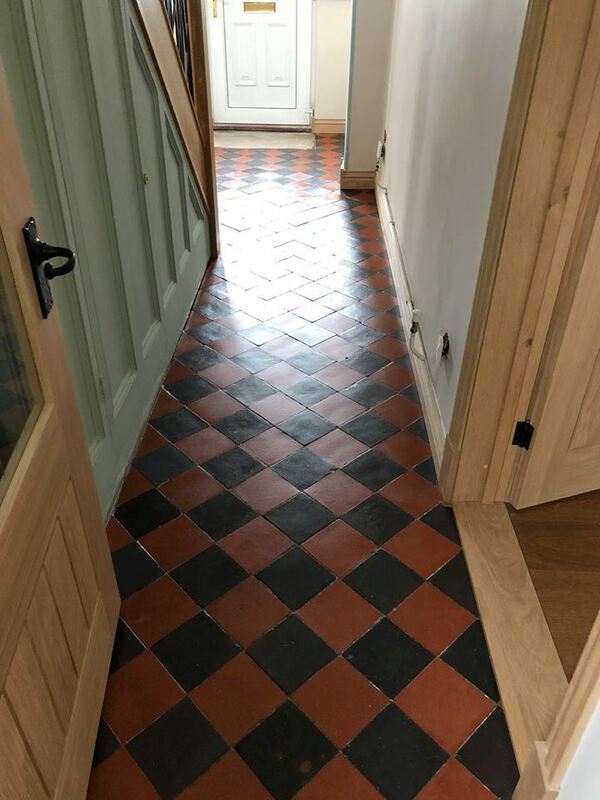 I had an enquiry from a client in the London commuter town of Berkhamsted who had a beautiful Encaustic tiled floor in their hallway which was in need of cleaning. 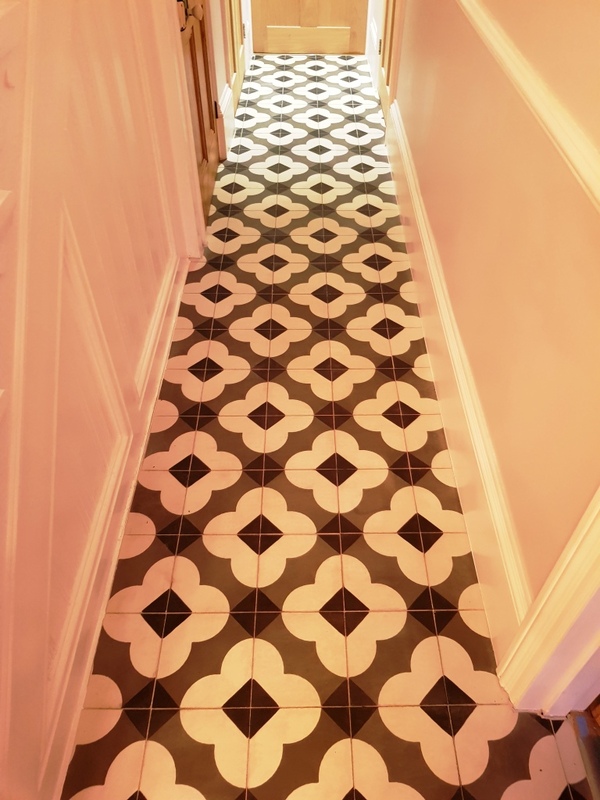 Encaustic tiles are made from layers of cement that are hydraulically compressed to make a very hardwearing surface that can then be decorated. 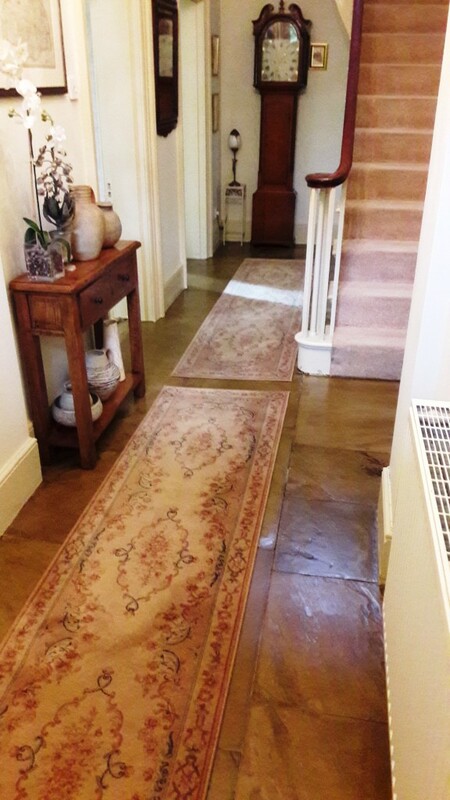 The result is an easy to clean hardwearing surface that is ideal for high traffic areas such as hallways. 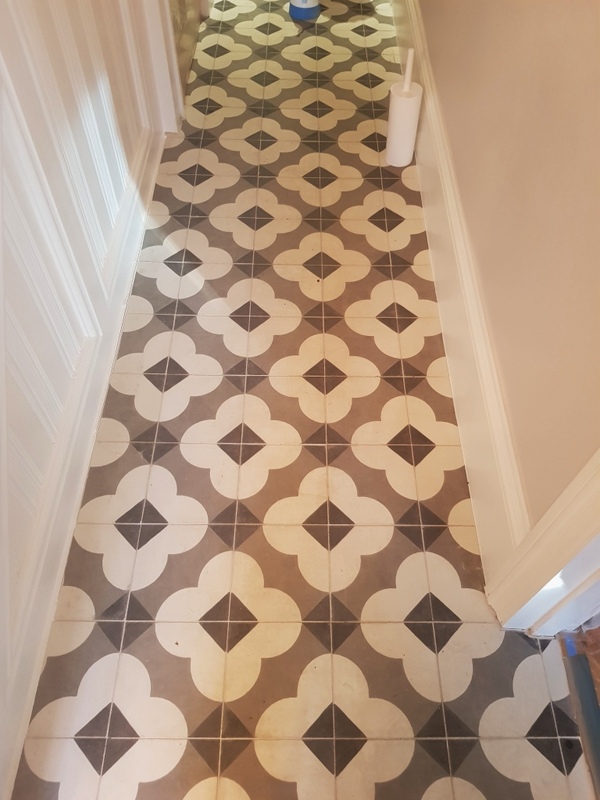 Encaustic tiles however are micro-porous so do need to be sealed to prevent dirt from becoming ingrained in the tiny holes. 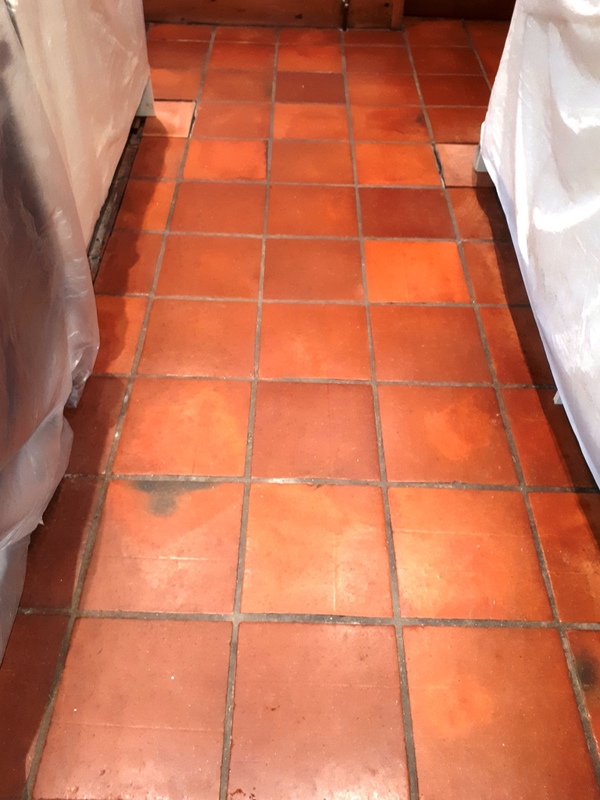 The tiles at this property in Berkhamsted had been sealed at some point in the past but over the years the sealer had worn down lettering dirt enter the pores making it difficult to clean effectively. The floor now required a deep clean and seal to bring back the life into this artistic floor pattern. We first removed what was left of the old sealer and ground in dirt using a coarse 400 grit Red burnishing pad attached to a rotary floor buffer. The burnishing pads we use are encrusted with industrial diamond and are applied using water for lubrication, once the pad has been run over all the tiles the floor is rinsed with more water which is then extracted with a wet vacuum to remove the slurry that is generated. 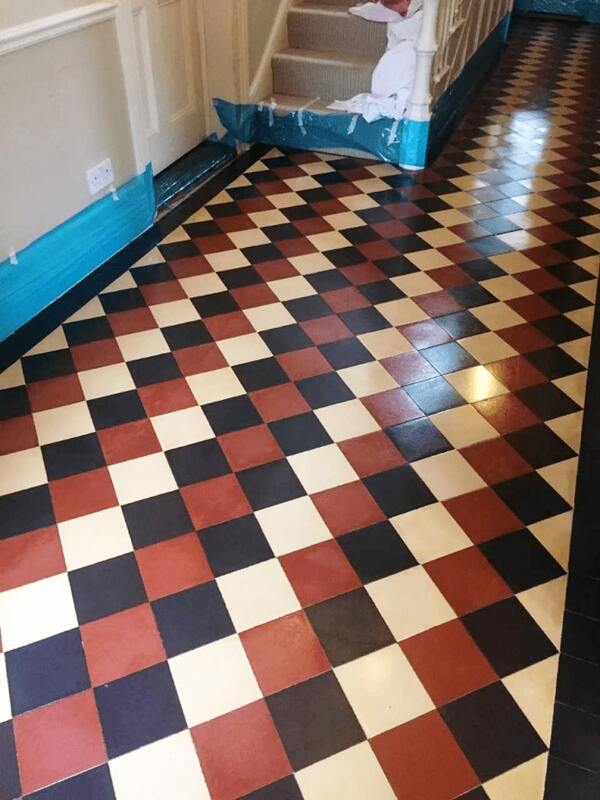 The coarse pad was the followed by a medium 800 grit burnishing pad which is the first step in restoring the appearance of the tiles and is applied and rinsed off using the same process as the 400 grit. 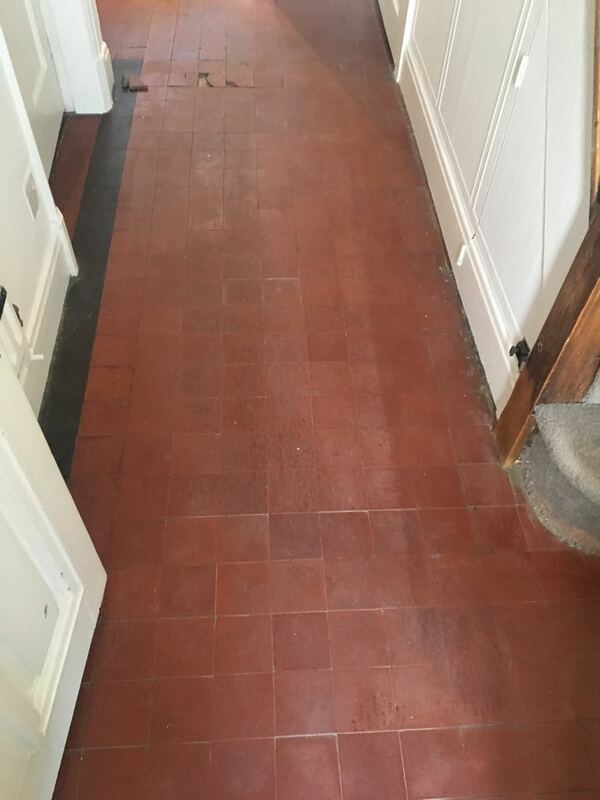 The 800 grit pads is followed by the 1500 grit pad which is the second step In restoring the appearance of the tile. Again, the pad is applied with water to lubricate and the floor given a good rinse afterwards. 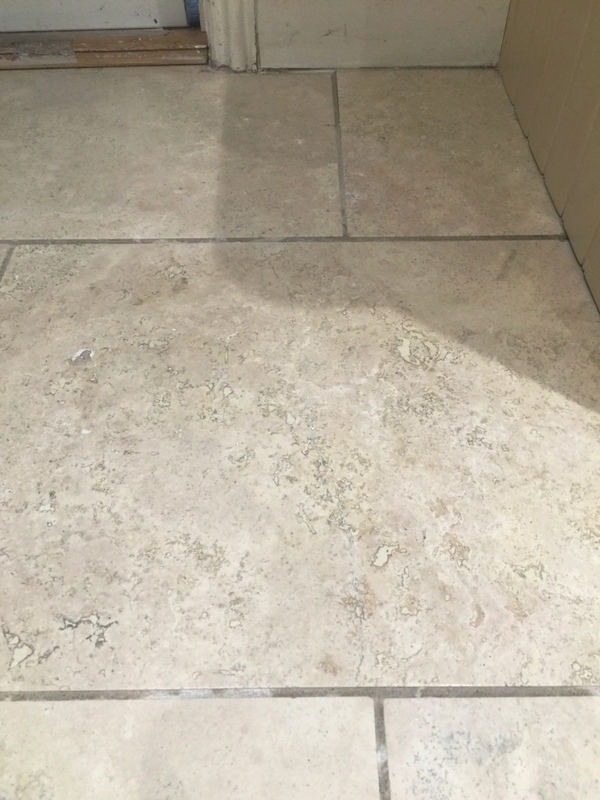 The next step was to get the grout clean which was done by applying Tile Doctor Pro-Clean which was left for ten minutes before being scrubbed in by hand with a narrow stiff brush. The floor was then given yet another rinse and then dried with the wet vacuum to remove the dirt that was generated from the grout. 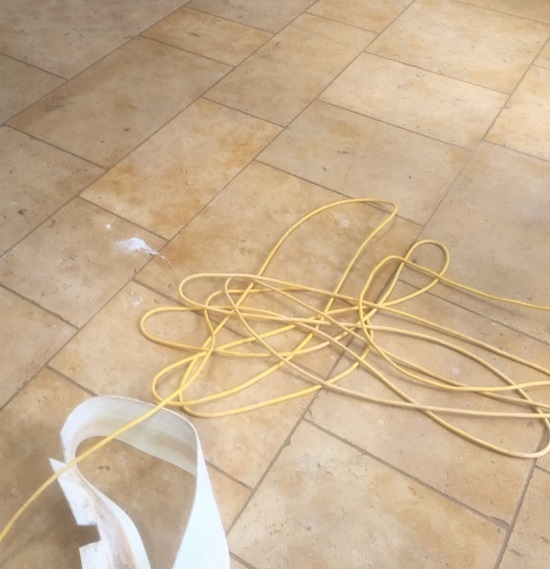 The last step in the cleaning process was to run over the floor with a very fine 3000 grit pad, this last pad is the final step in restoring the appearance of the tile and is applied dry with only a little water that is sprayed on using a technique we like to call spray burnishing. 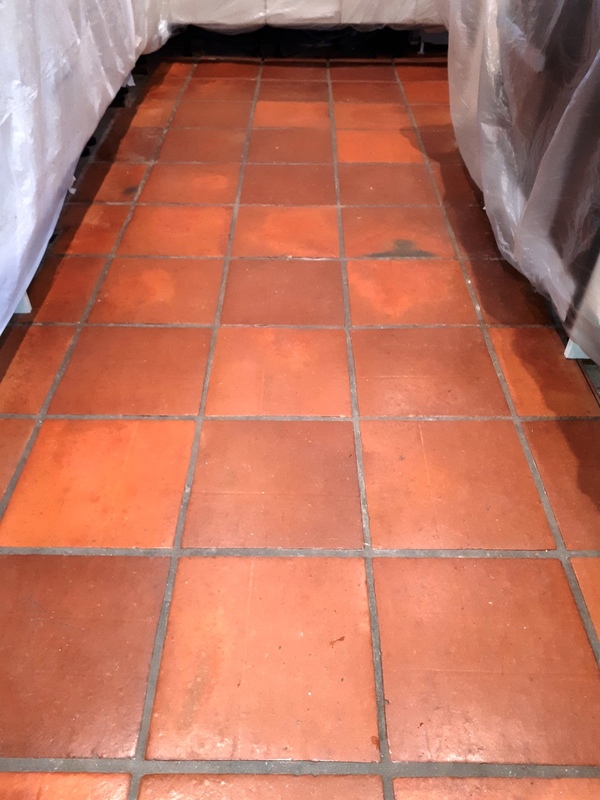 Once the floor was dry it was sealed using two coats of Tile Doctor Colour Grow which is an impregnating sealer that seeps into the pores of the tile protecting it from within. 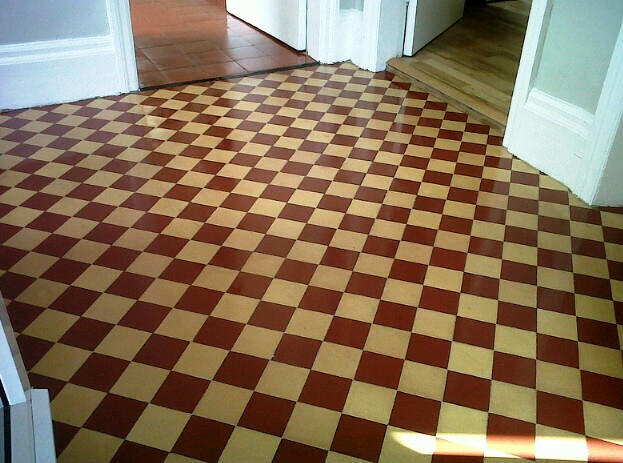 This sealer has the added advantage of enhancing the existing colours in the tile improving its overall appearance. The overall process worked incredibly well and made a huge difference to the floor as you can see in the final photograph. 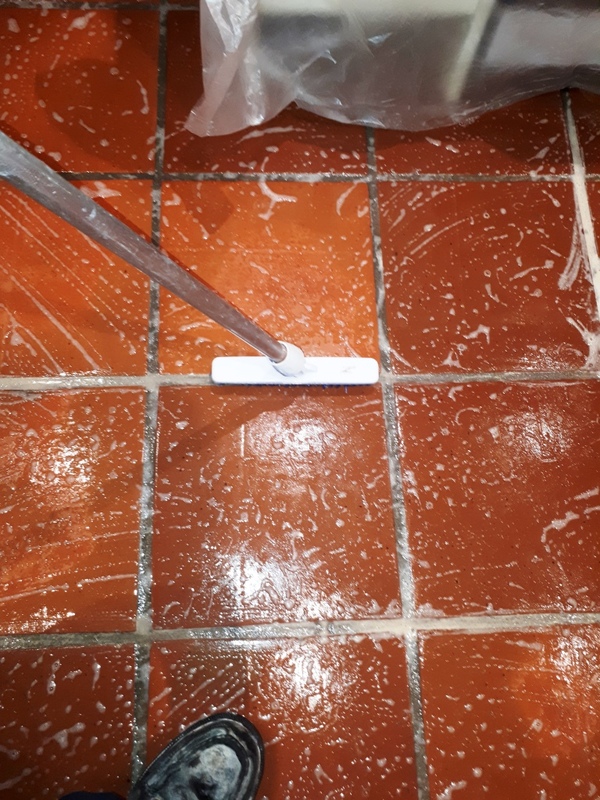 To keep Encaustic floor tiles in first class condition I recommend the use of the Tile Doctor Neutral Tile cleaner which being pH neutral does not reduce the life of the sealer and is ideal for the cleaning of all types of sealed floors. The product comes in a concentrated form, so I recommend it’s used in a mild 1-30 dilution spray applied and wiped over with a microfibre flat mop, then buffed dry. When the old Rowntree Mackintosh sweet factory at Chapelfield in Norwich was closed down and eventually demolished, our client acquired a quantity of the beautiful green/black slate flooring tiles which had formed part of the reception area of the plant. 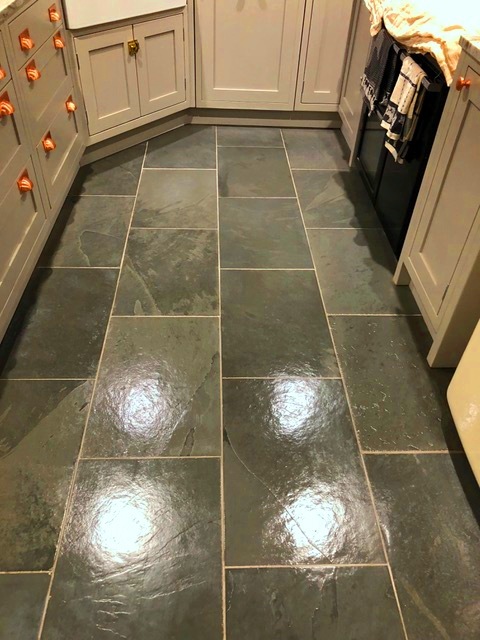 They had laid these tiles edge to edge with no grouting in their large kitchen/dining room extension at their home in the village of Wreningham and the result was perhaps one of the most impressive examples of high-quality slate flooring we have ever seen in any location. The Slate floor tiles had been protected against oil and fluid spillages with the application of a penetrating sealer after installation at the property but, over the ensuing years, there had been some inevitable degradation of the sealer and the entire area was now in need of a thorough deep-clean and reseal in order to remove the coating of general grime, bring out the strikingly deep colour and restore the stain resistance. 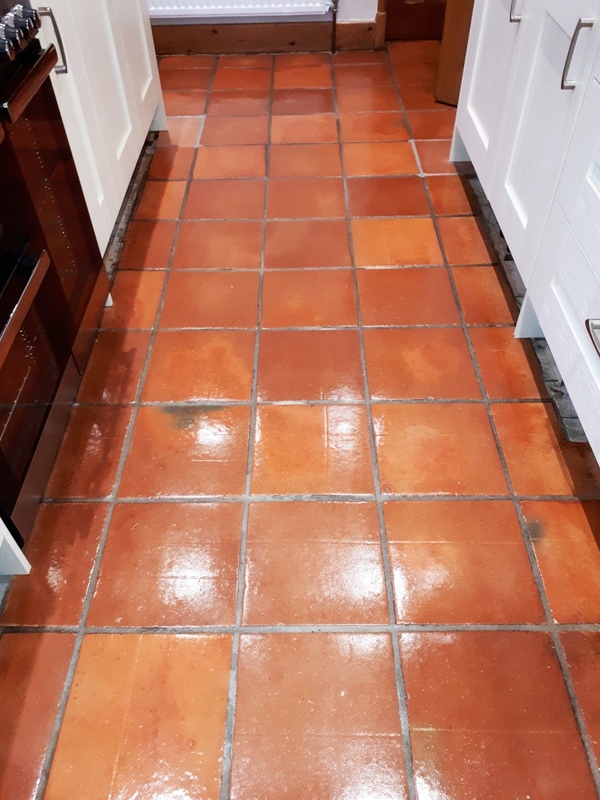 As there was no topical finish to remove, we proceeded to deep-clean the surface of the tiles using Tile Doctor Pro Clean at a less powerful mix ratio of 1-part water to 5-parts cleaner. This solution was applied to the tiles and left to soak in for ten minutes before being worked in using a black scrubbing pad fitted to our rotary machine. The resulting muddy slurry was then power rinsed off the floor with water and then extracted with our Ninja machine which has a very powerful vacuum. The high pH product was so effective, no further cleaning was necessary. The whole area was then dried thoroughly using two large industrial fans which dramatically reduced the drying time, enabling us to move onto sealing later that afternoon. We don’t normally recommend cleaning and sealing in the same day as the floor has to be dry before sealing however in this case we were able to progress through the cleaning process much quicker than anticipated. Before sealing the floor was spot tested in different places using a moisture meter. 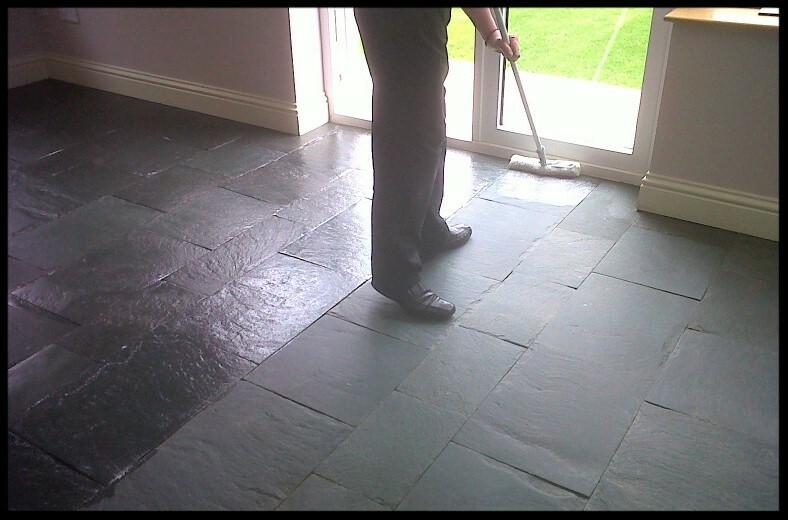 All was well, so a single coat of Tile Doctor Colour Grow was applied to the Slate tiles. Colour Grow is a penetrating sealer that seeps into the pores of the stone protecting it from with and as its name suggests also intensified the natural black/green colours of the slate in the process. 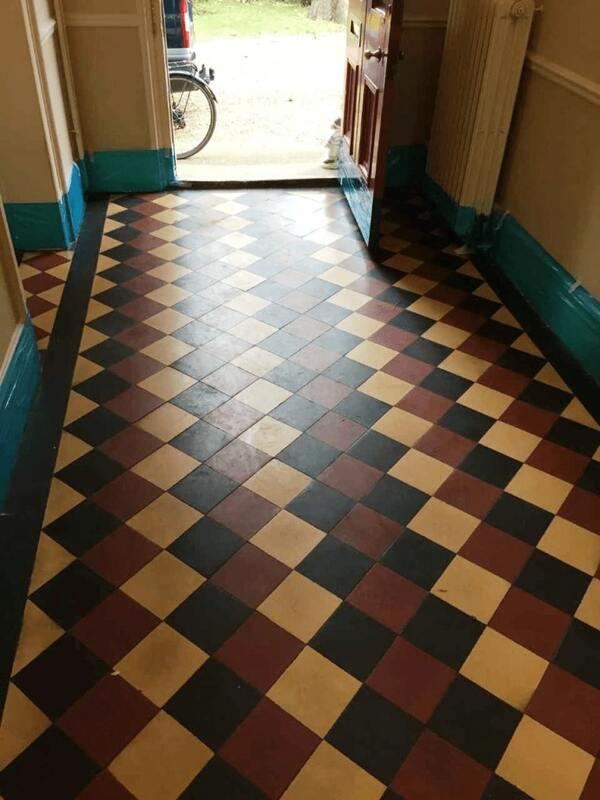 Once the first coat was dried I followed up with three coats of Tile Doctor Seal & Go, which further enriched the colour and provided a pleasing mid-sheen finish to the floor surface. 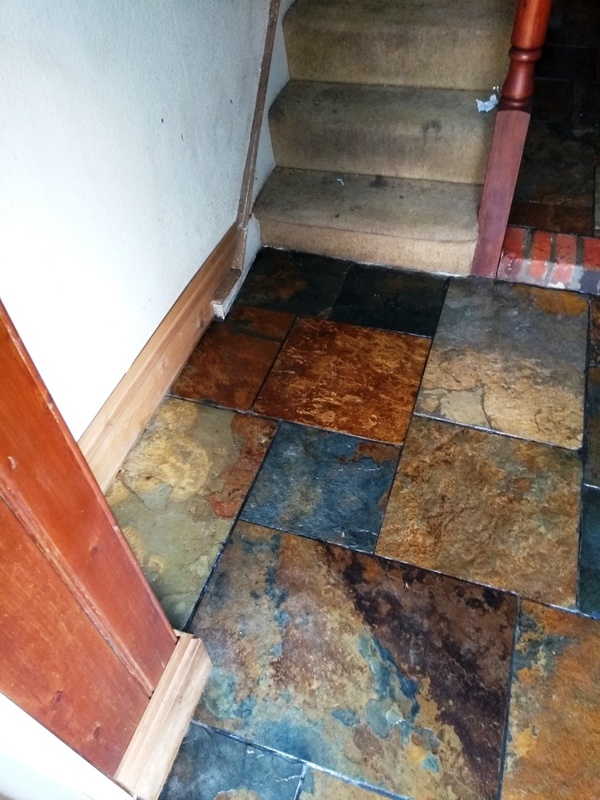 The whole process really put the life back in the stone floor and the tiles which were once dull now look vibrant and colourful. 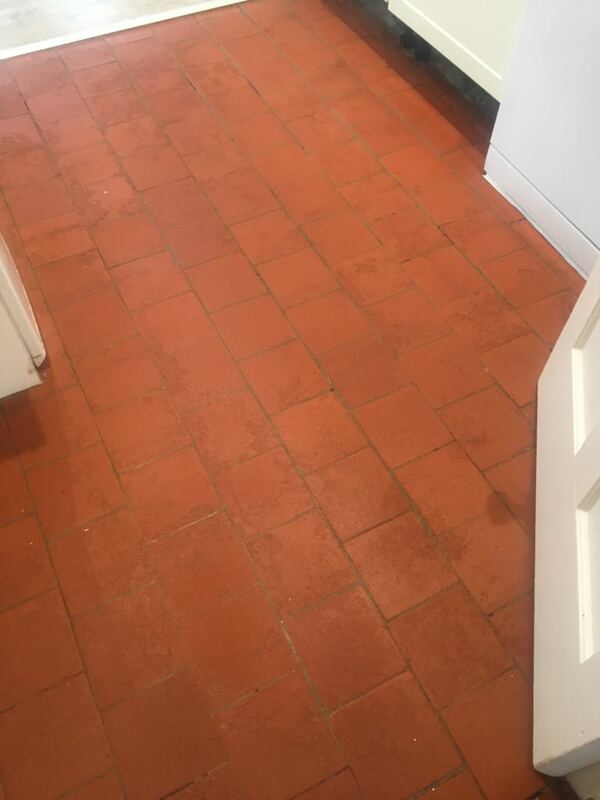 A customer in Redditch had recently had a new kitchen fitted and prior to that had tried to seal the Mexican Terracotta tiled floor themselves, however they were not happy with the results, so they contacted Tile Doctor to see if an improvement could be achieved. The sealer they used was matt which didn’t show off the Terracotta at its best and the tile and especially the grout were not as clean as they could have been. Getting the tile and grout clean before sealing is essential otherwise you end up sealing in the dirt. To get the best from the floor I recommended stripping off the sealer, giving the tile and grout a deep clean and then resealing with a satin sealer. The customer agreed and keen to get his new kitchen looking its best booked me in to do the work. My first tasks was to protect the new kitchen units from splashing with plastic sheeting and by removing the kick boards. 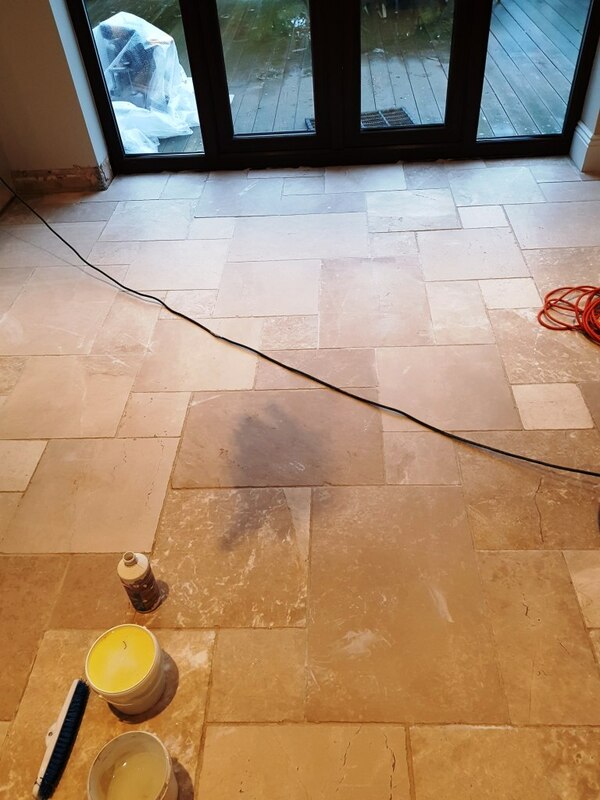 Once done I began the process of removing the existing sealer by applying Tile Doctor Remove and Go which as the name implies is a strong coatings remover that safe to use on Tile and Stone. The product was dilated with water, applied to the tile and grout and left to soak in for about ten minutes. The floor area between the kitchen units was quite tight so on this occasion I decided to scrub the tiles with a deck brush and hand brush as opposed to using a rotary machine fitted with a scrubbing pad. 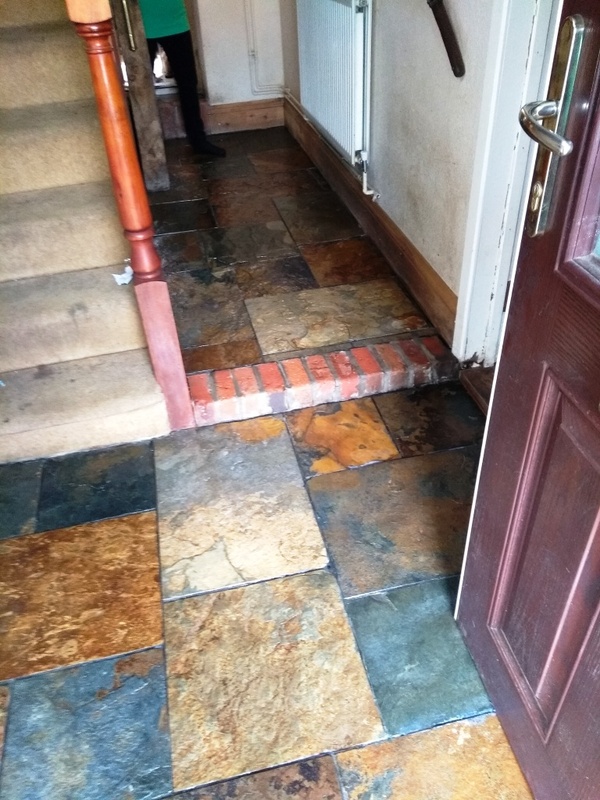 The Remove and Go did the job and the sealer was removed and the floor rinsed off with water to reveal the original tiles. 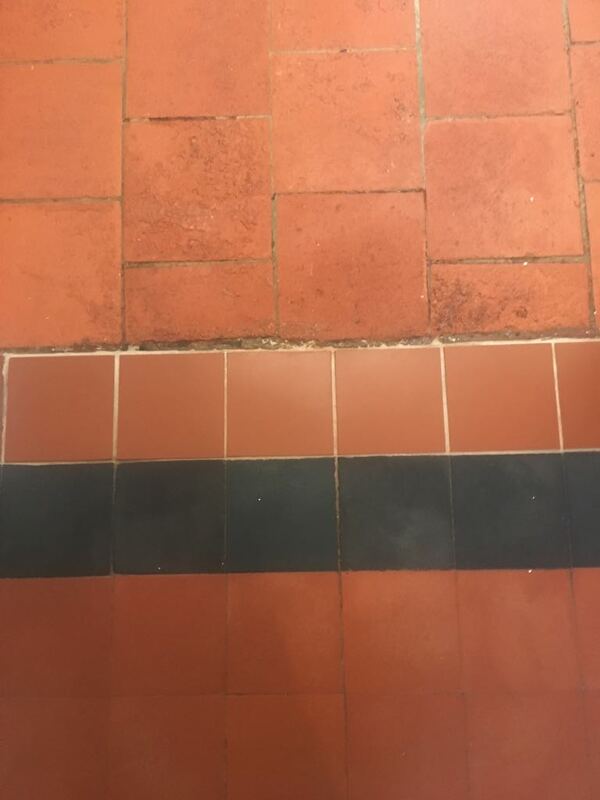 The next step was to give the Terracotta tile and grout a deep clean by scrubbing in a medium dilution of Tile Doctor Pro-Clean. 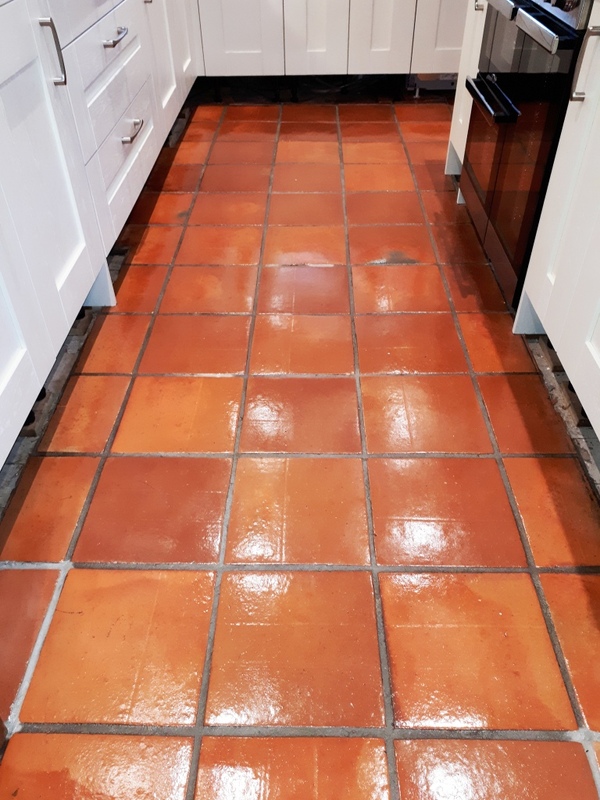 Mexican Terracotta can be difficult to clean due to the makeup of the tile, but the Pro-Clean scrubbed in with the brushes I used earlier worked well. The now soiled cleaning solution was rinsed off with water and then extracted using a wet vacuum. 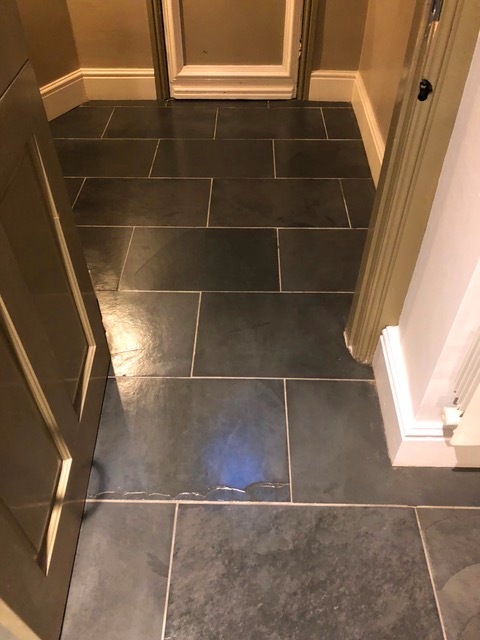 The customer had laid some new tiles to fit in with the new units but asked me to grout them so with time to spare before leaving for the day I grouted them in with a flexible grout and polished off any grout smears. 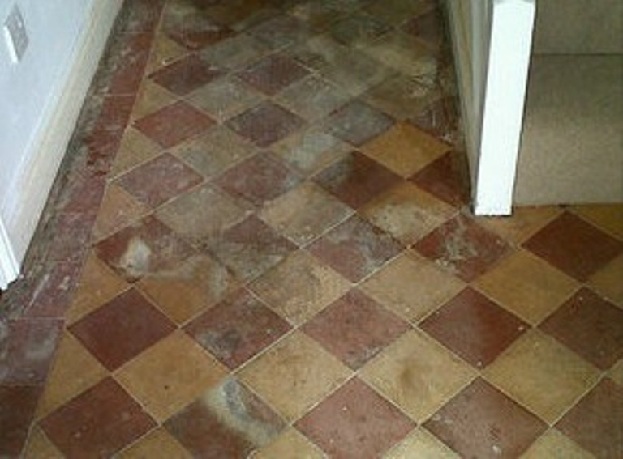 It’s important that tiles are dry before sealing so the floor was then left for two days so it could dry out. Upon my returned to seal the tiles I first checked with a damp meter that they had indeed dried. All was well, so I began the process of applying Seal and Go which is a water-based sealer from the Tile Doctor range that leaves the satin finish the customer wanted, also being water based it doesn’t leave a smell as it dries. 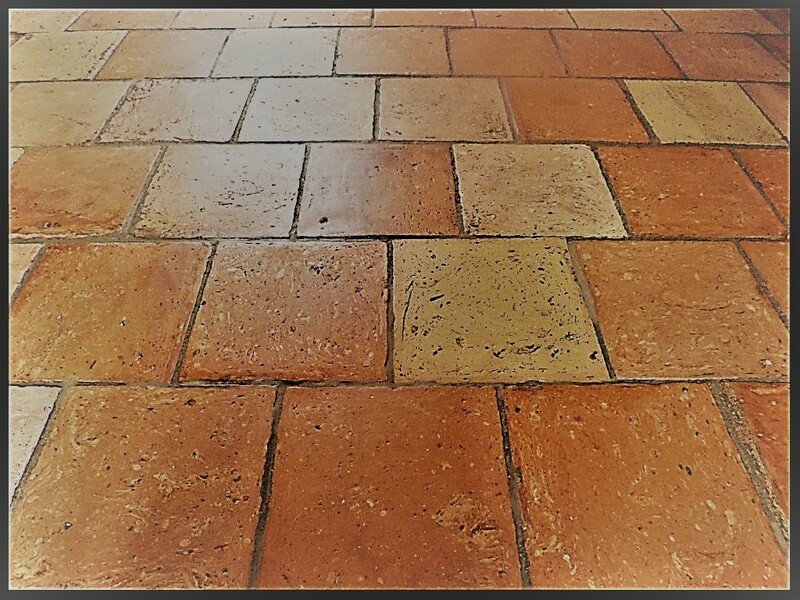 Mexican Terracotta is notoriously very porous, so numerous coats of seal are required and in fact this floor needed eleven coats. I applied a few more coats to the new tiles so they would blend in better with the existing tiles. 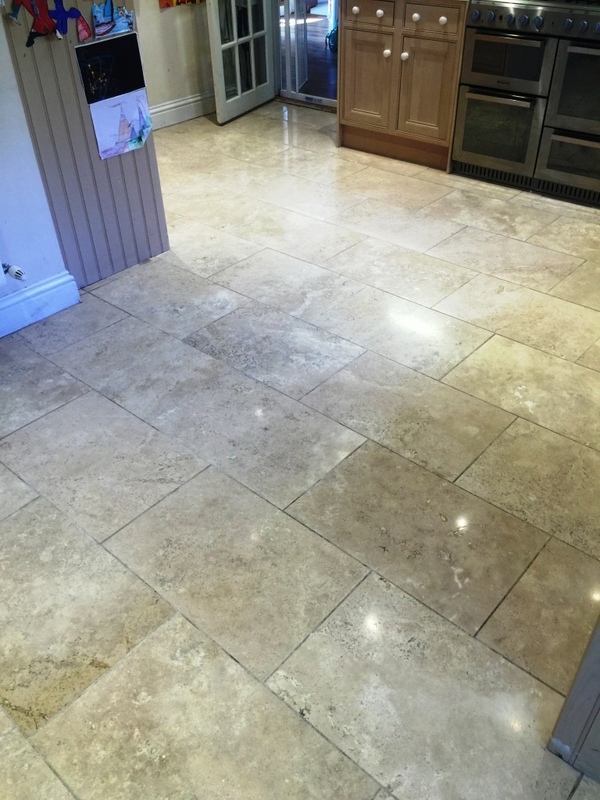 The customer was very pleased with the results and I left them with a bottle of Neutral Tile Cleaner to help maintain the tiles appearance going forward. 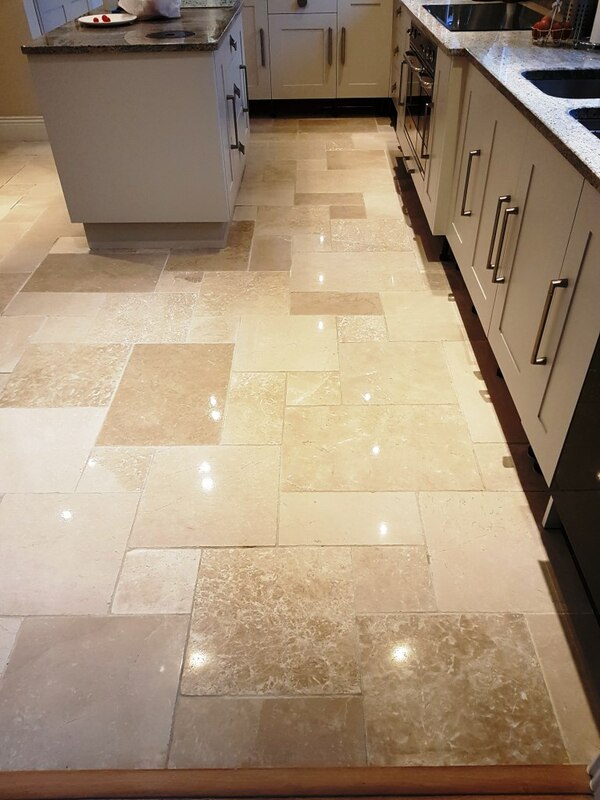 Getting the best out of a natural stone floor isn’t straight forward and we often get calls from customers who have come to the realisation they need help. 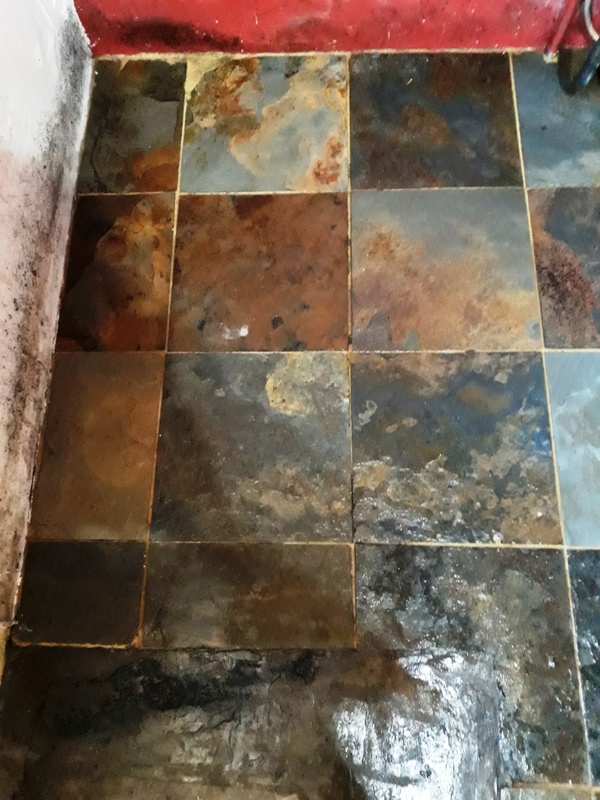 An example of this being a lady from the village of Helsby who got in touch after her husband had given up following spending two days cleaning their Limestone tiled kitchen floor but actually making it worse. On arrival the first step was to give the floor a general clean with a focus on cleaning the grout lines and removing any grit from the floor. 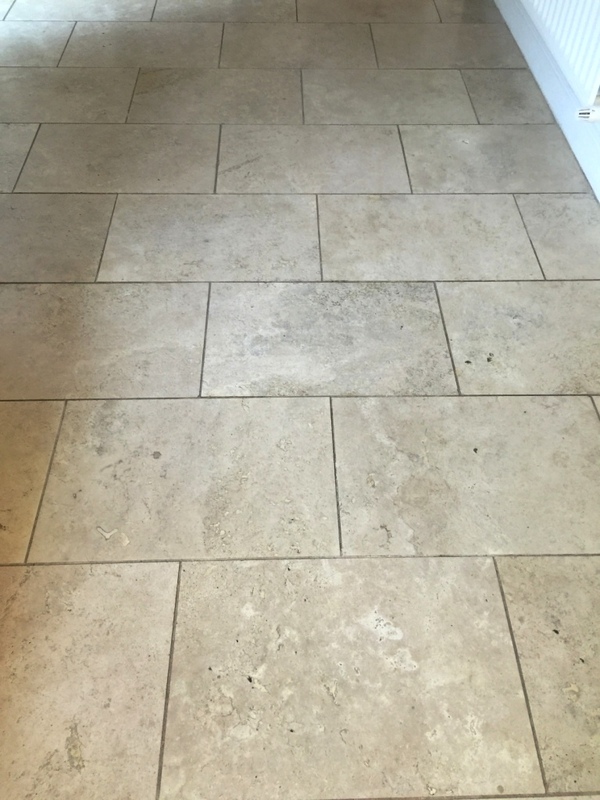 I used a dilution of Tile Doctor Pro-Clean which is an alkaline tile cleaning product that is safe to use on grout and stone. 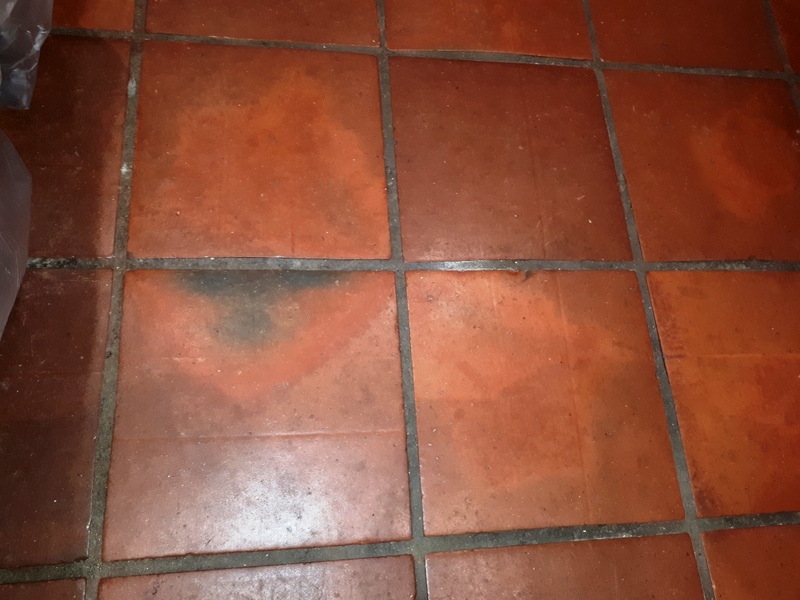 The cleaning solution was applied by sponge mop and left to soak for ten to twenty minutes before being scrubbed in along the grout line using a stiff narrow brush to get them really clean. Once done the floor was then rinsed with clean water and the now soiled cleaning solution removed with a wet vacuum. The next step was to use a set of Tile Doctor burnishing pads to polish the stone back to a deep shine. The pads which are encrusted with industrial diamonds are applied with a rotary floor buffer in sequence from coarse to extra fine. The first pad has a Coarse 400 grit which is applied with only water for lubrication, removes minor scratches, sealers, and the top surface dirt. Working in small areas, I applied the pad across the Limestone, rinsing in between and picking up the soiled solution with a wet-vac machine. I then repeated this same procedure with the Medium 800 grit pad which is the first stage polishing pad again rinsing with water after use. The next two pads are a Fine 1500 grit and Extra Fine 3,000 grit which really build up a high-quality polish on the stone. 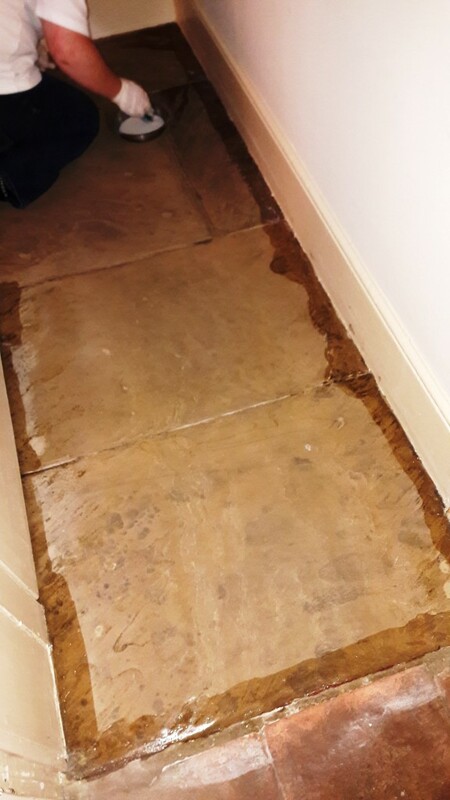 The floor was left to dry off fully overnight and I returned the next day to seal the Limestone first checking with a damp meter that the stone was dry. 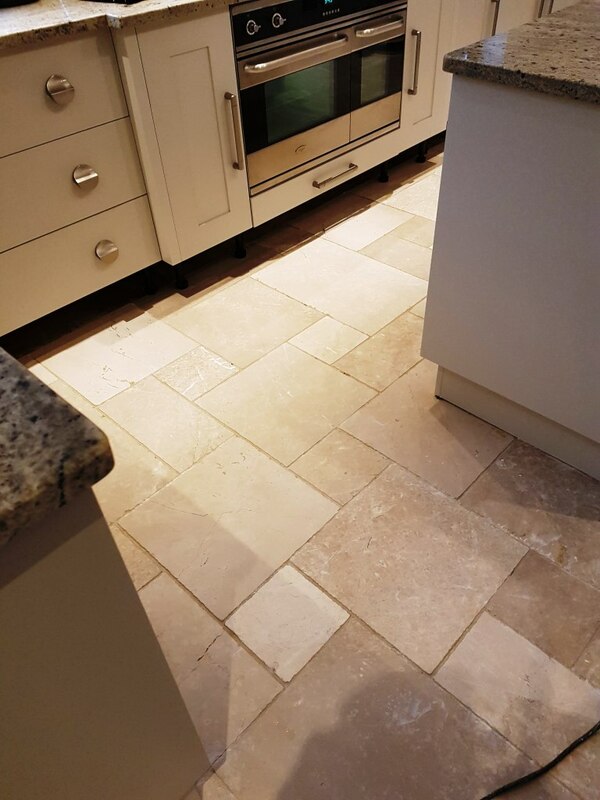 The customer wanted a natural look finish to the Limestone, so to seal the tiles I applied two coasts of Tile Doctor Ultra Seal which is an impregnating sealer doesn’t change the look of the stone in anyway. Ultra Seal is an impregnating sealer that works under the surface by occupying the pores in the stone thus preventing dirt from becoming ingrained. Once the sealer had dried the floor was treated to a gentle buff with a white pad to bring up the shine even further. Once complete the stone looked a lot healthier and the grout looked much cleaner. 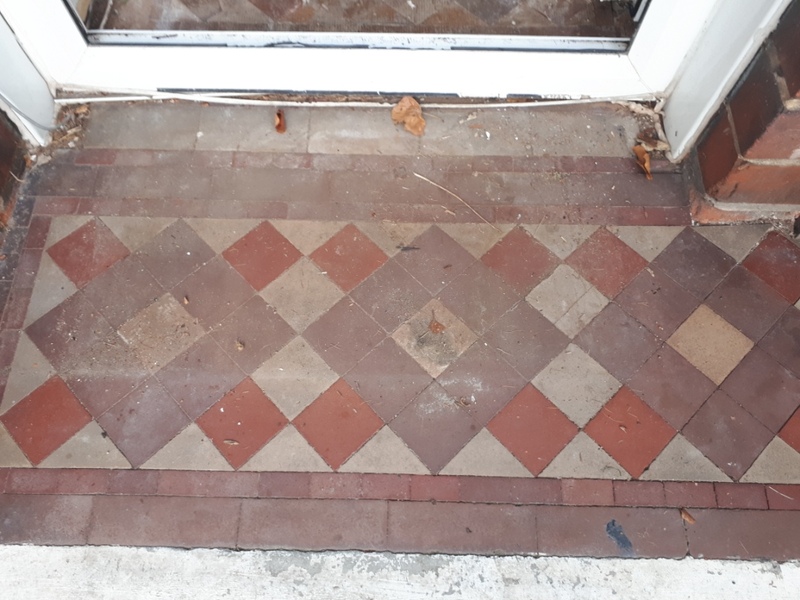 There are thousands of Victorian tiled hallways in and around Norwich and I often get called to work on them, however this was a particularly abused and neglected example I thought you might find interesting. 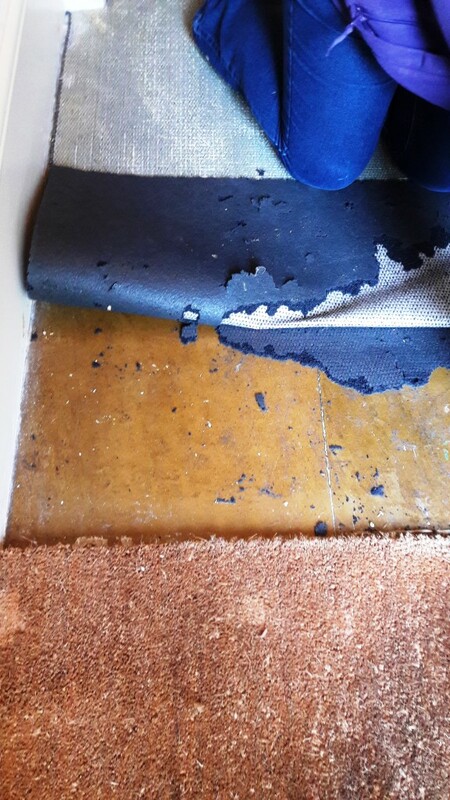 The surface had clearly been both painted red at some point (possibly with an old lead-based paint) and then completely covered with rubber-backed underlay and carpeted, a thick layer of double-sided carpet tape remaining firmly stuck in patches around all the edges of the floor area. 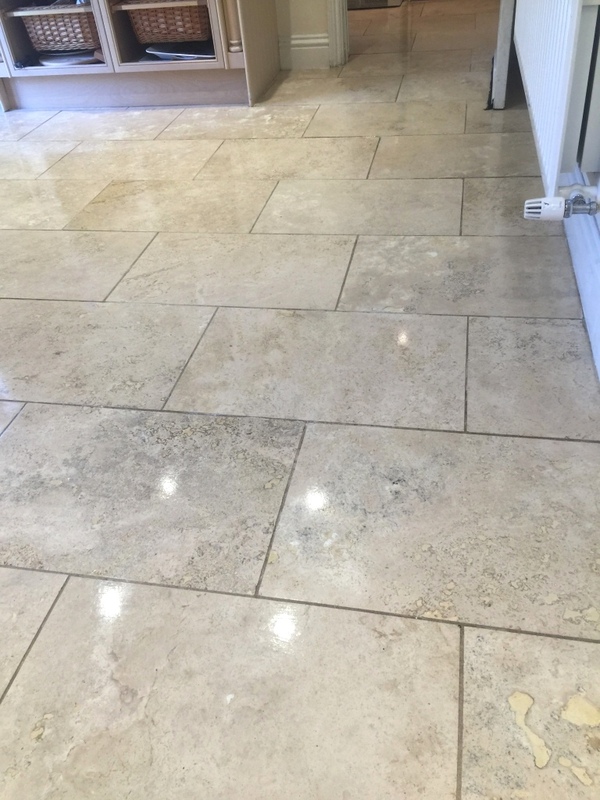 Firstly, we cleaned the whole area using a strong solution (1:3) of Tile Doctor Pro-Clean, which is a high alkaline stripper and cleaner, agitated with a black scrubbing pad fitted to a rotary machine. All products and slurry were then power rinsed and vacuumed away to reveal the improved floor. 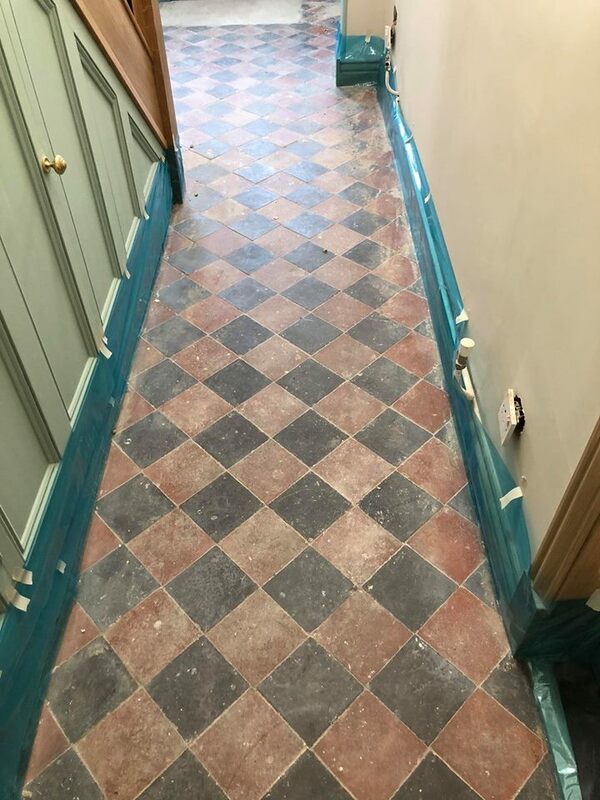 There were still a significant number of glue patches and paint spots around the edges of the floor, so these were tackled using Tile Doctor Remove & Go, which softened them enough to enable us to remove them with a sharp-bladed scraper. 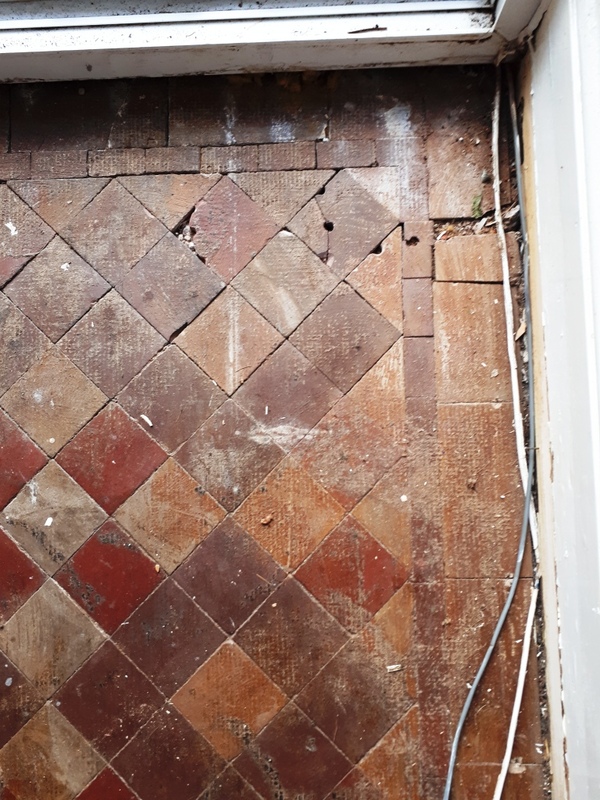 Unfortunately, the decaying rubber underlay had left a pattern on the tile surface which was most obvious at the doorway into the terracotta tiled kitchen. We almost completely removed this using Tile Doctor Oxy-Gel which being in gel form allows it work on the problem area longer. It was painted on a brush and kept moist for two hours under a layer of cling film which drew out virtually all the contaminant from the tile. 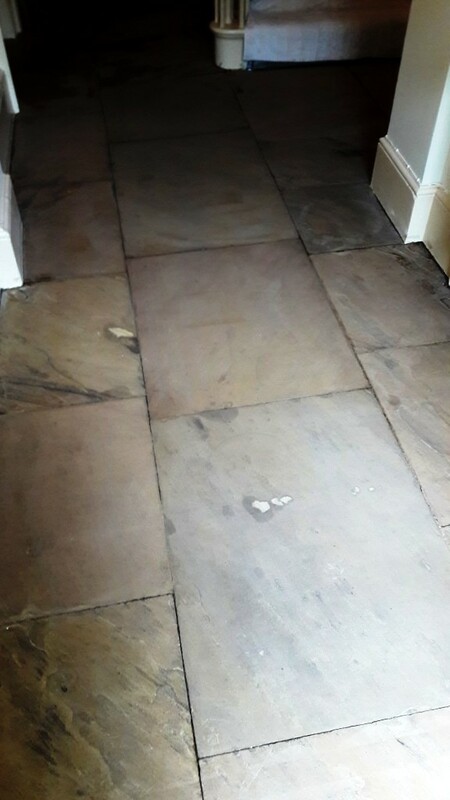 The next concern was that an original Victorian floor of this age would almost certainly have no damp proof membrane and an area near the front door which showed evidence of efflorescence salts was treated with Tile Doctor Acid Gel in order to remove the white deposits and further inhibit the production of more in the future. 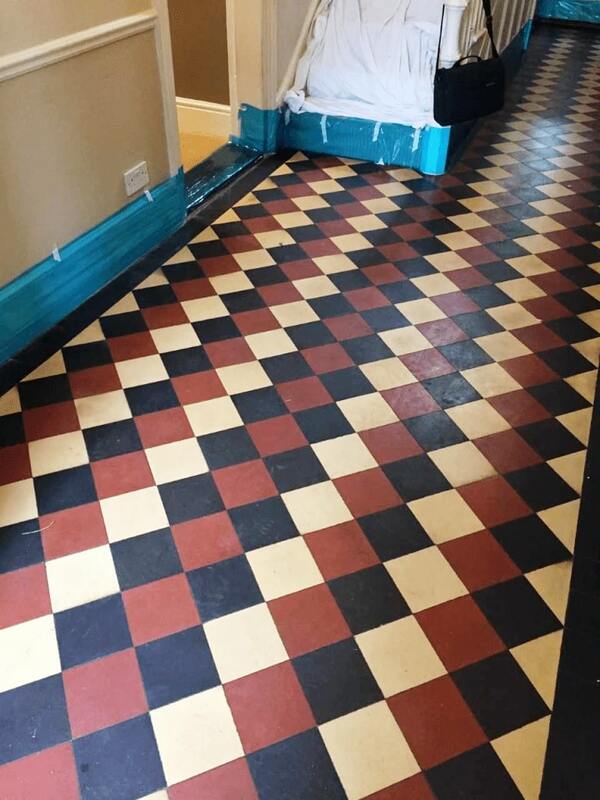 The whole area was then lightly buffed using the rotary machine and a 1500 grit diamond pad with water in order to remove any remaining fine paint spots and restore a silky feel to the surface of the tiles before leaving the floor to dry overnight with assistance from our dehumidifier. When we returned the following morning, our damp meter showed us that the moisture content in the substrate was probably going to be too high to allow us to use an acrylic sealer to provide the sheen which the client had requested; so we decided to spray-buff the floor using a 3000 grit diamond pad on the rotary machine followed by the application of Tile Doctor Colour Grow, a colour enhancing penetrating sealer which sits just below the surface of the tile and leaves no visible finish. Finally, the whole floor was spray buffed to a low sheen with a white maintenance pad on the rotary machine and any resulting dust vacuumed away. 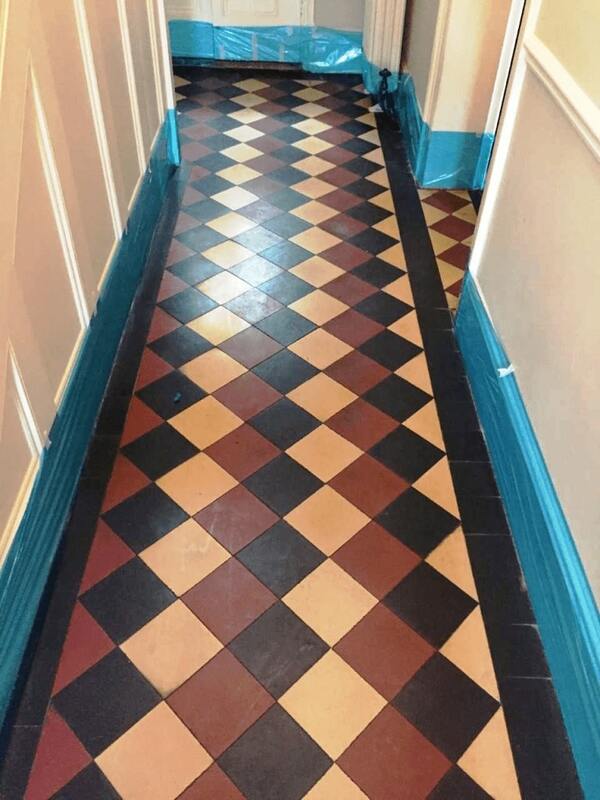 The Victorian tiles now look fantastic and have become a great asset to the property as original features like these are very sought after. 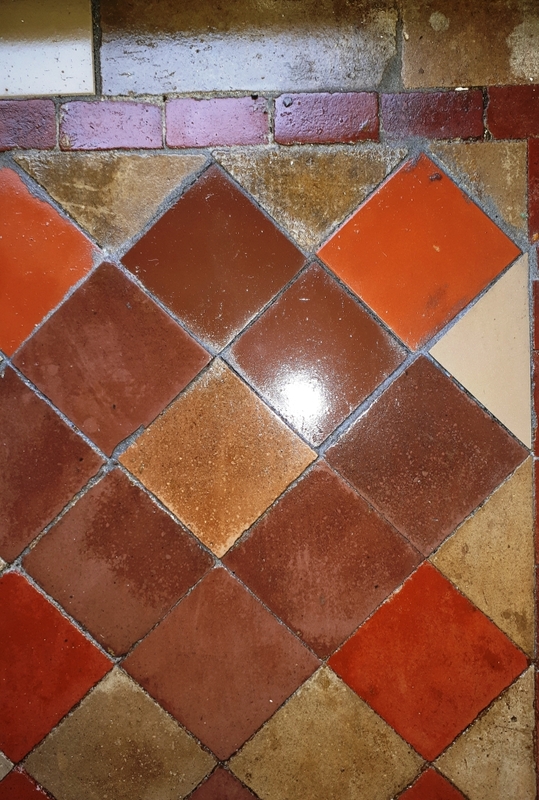 This post follows on from the Victorian Tiled floor article I published earlier, if you recall I was asked to restore a Victorian Tiled Hallway at a house in Dudley and there was a section that was Terrazzo, so I thought it would make sense to write about this separately as the cleaning method is different. 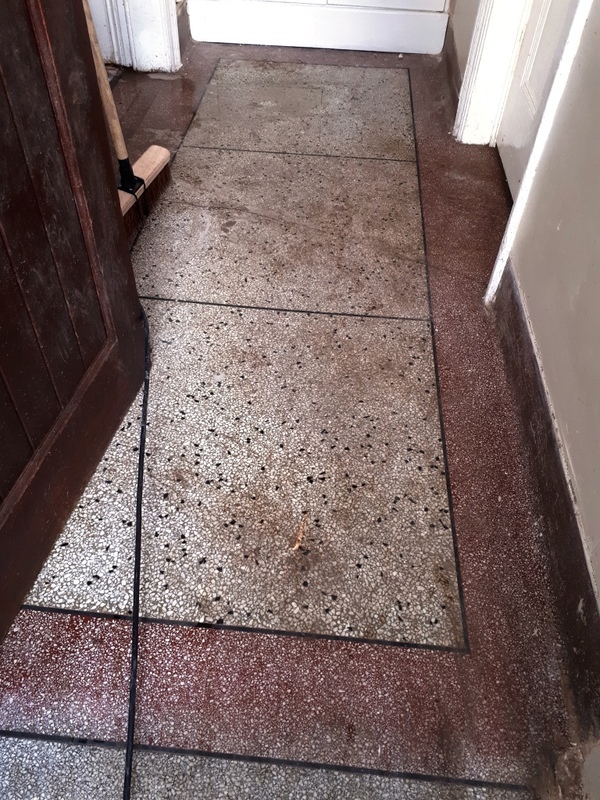 Both period floors were original, having been installed when the house was built over 100 years prior and whilst Victorian tiles are quite the norm in these properties it’s quite unusual to find Terrazzo as this was mostly used in large public buildings. 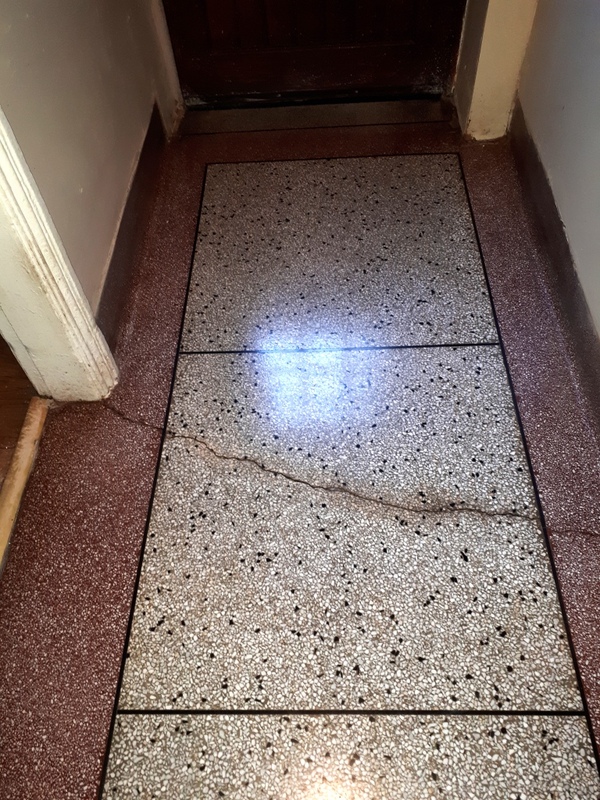 There was a crack running across the floor which is quite a common problem with Terrazzo as it’s laid in one piece like concrete and any movement in the ground will cause stress leading to a crack. 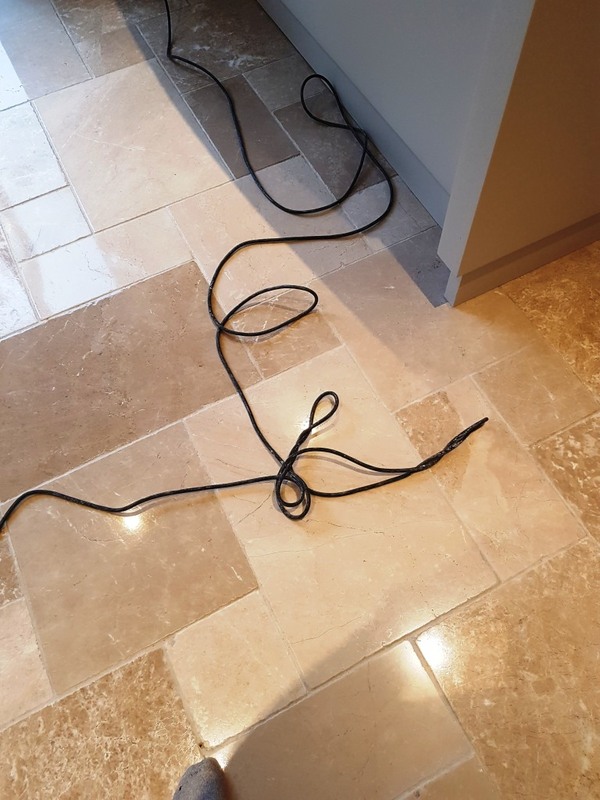 Unfortunately, the only way to resolve this properly is to have a Terrazzo expert relay that section of the floor which would prove expensive. 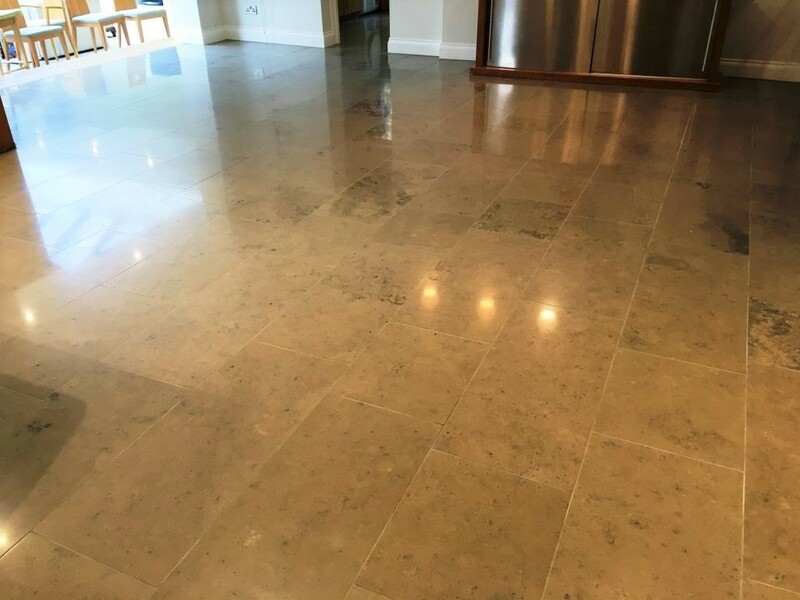 Terrazzo is the by-product of broken pieces of stone, often Marble, Limestone and Granite, which rather than being wasted are set into to a cement screed and poured onto the floor, then once the screed is set it is grinded to a polish. The polish on Terrazzo will eventually wear down with use and to restore the appearance it needs to be burnished with a series of pads with different grits from coarse to fine. So, to start the renovation I gave it a general clean with Tile Doctor Pro-Clean mainly to remove any grit before burnishing. Next, the Terrazzo tiles were cleaned using a coarse 400 grit pad fitted to a rotary machine and lubricated with water. This process removes dirt and any coatings such as sealers and the floor needs to be rinsed afterwards to remove the slurry that is generated. Then to build back the polished appearance, the floor is burnished with an 800 grit medium pad followed by a 1500 grit fine pad. Less water is used this time, but you do need to rinse the floor again after each pad to remove any slurry gets generated during the process. Once this was done the floor was dried with a wet vacuum and left to dry off fully overnight. 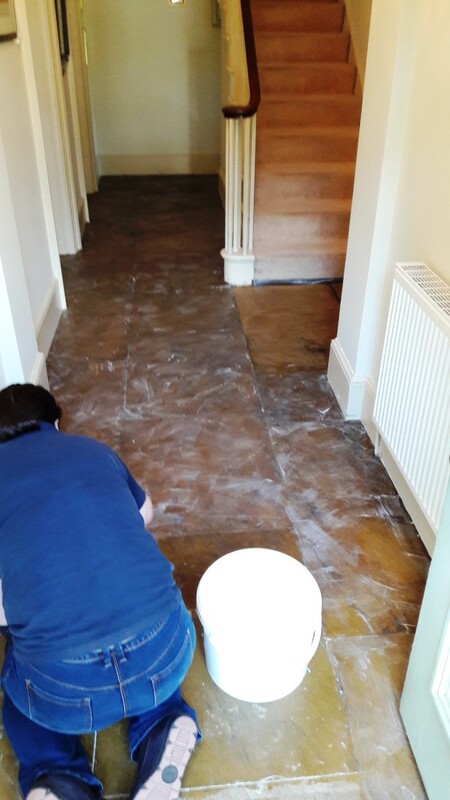 The next day, I returned to the property and started with a damp test to make sure the floor was dry and ready for sealing. The floor was dry so I finished the Burnishing process by applying the last pad in the set which is a 3,000 grit (very fine) pad that adds the final polish to the Terrazzo. To protect the floor from staining and dirt becoming ingrained in the pores of Terrazzo it was then sealed with two coats of Tile Doctor Colour Grow which is a colour enhancing impregnating sealer that protects from within. Once the sealer had dried the floor was buffed with a white pad. The floor looked a lot cleaner and shiner at the end and the customer was very happy with the transformation.